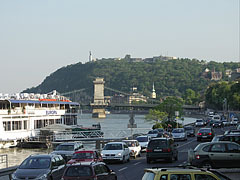 The János Hill ("János-hegy") with the Elisabeth Lookout Tower also can be seen in the distance. 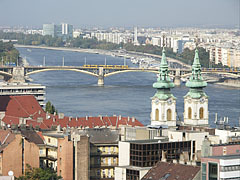 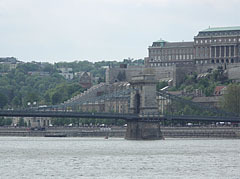 That is still part of Budapest city. 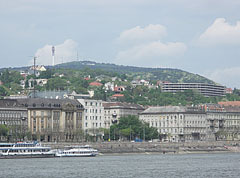 And in the distance the János Hill (or János Mountain, "János-hegy") can be seen with the Elisabeth Lookout Tower on its top. 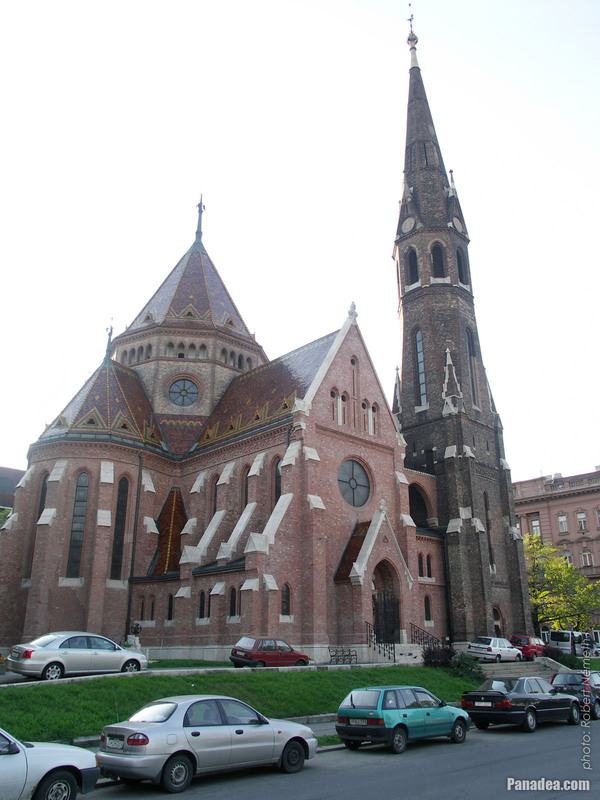 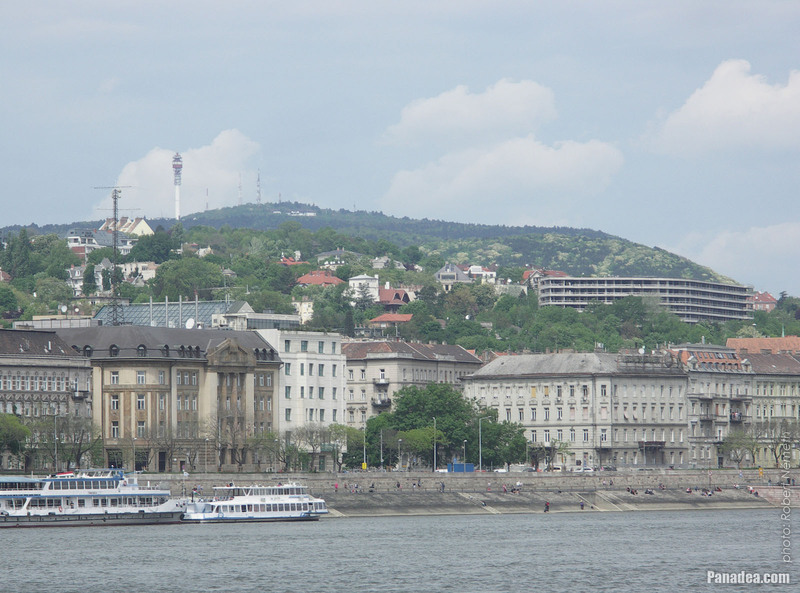 By the way, that is the highest point of Budapest city. 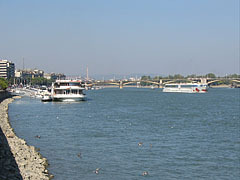 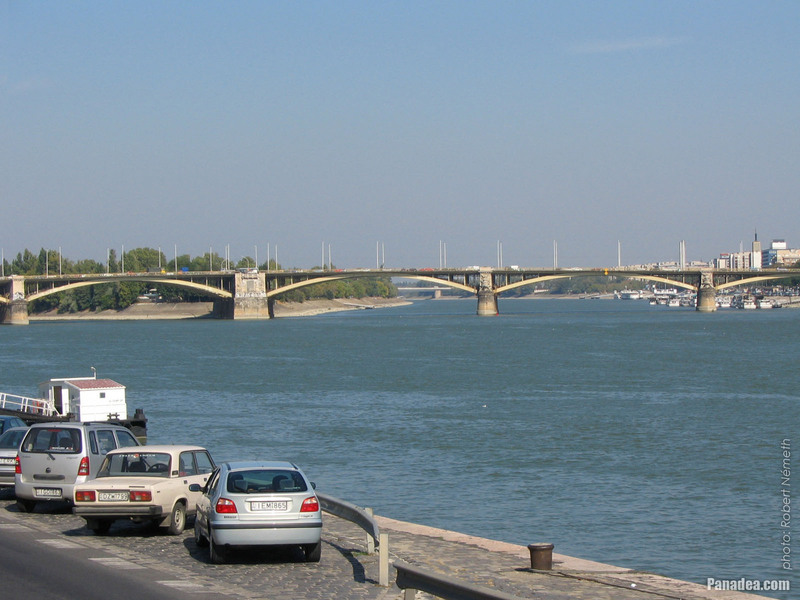 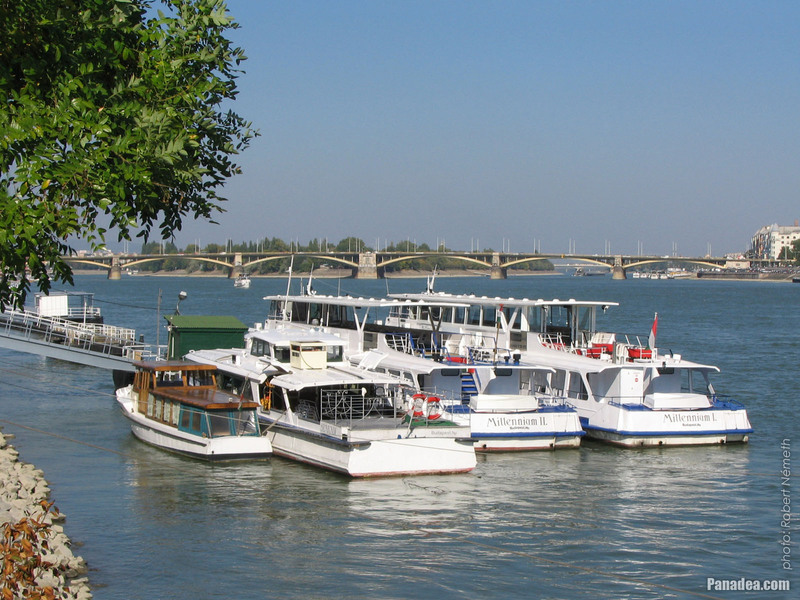 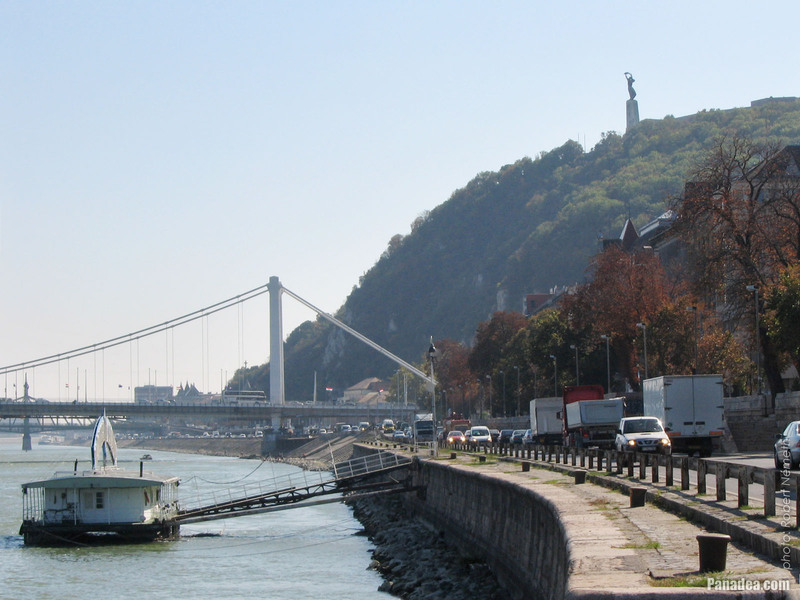 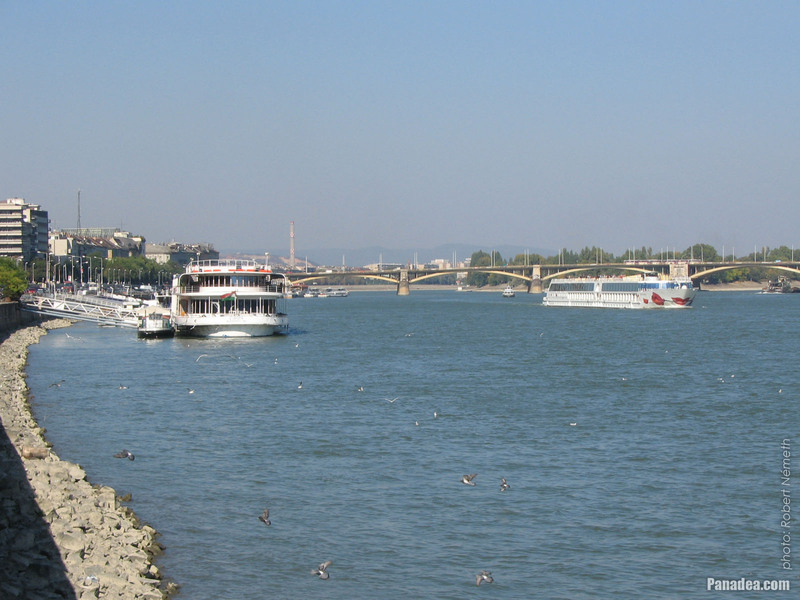 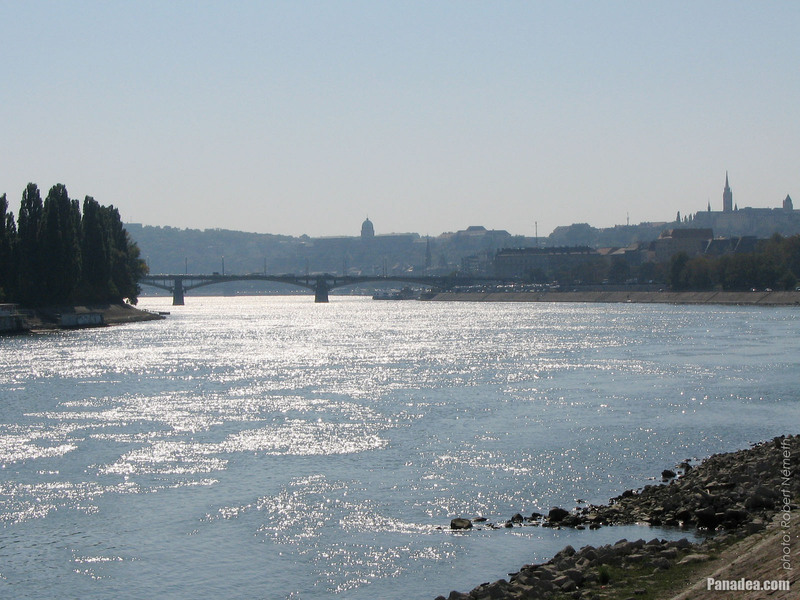 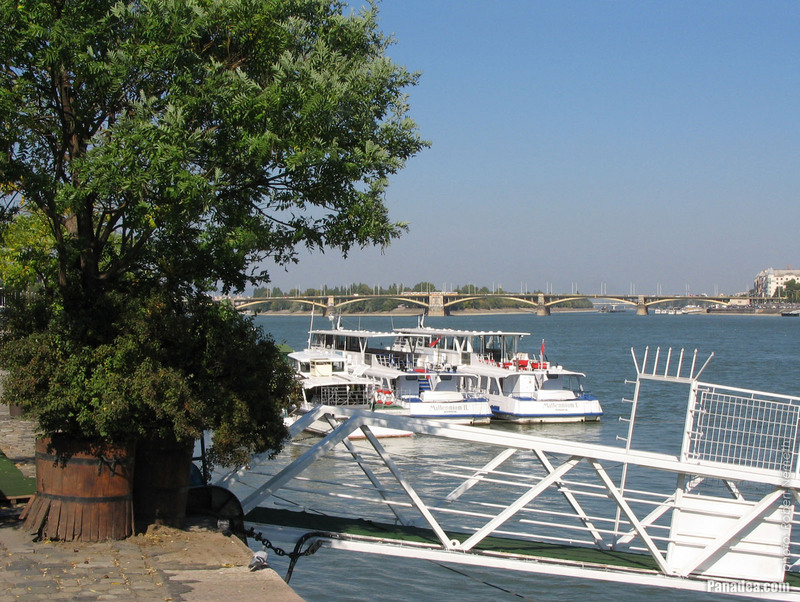 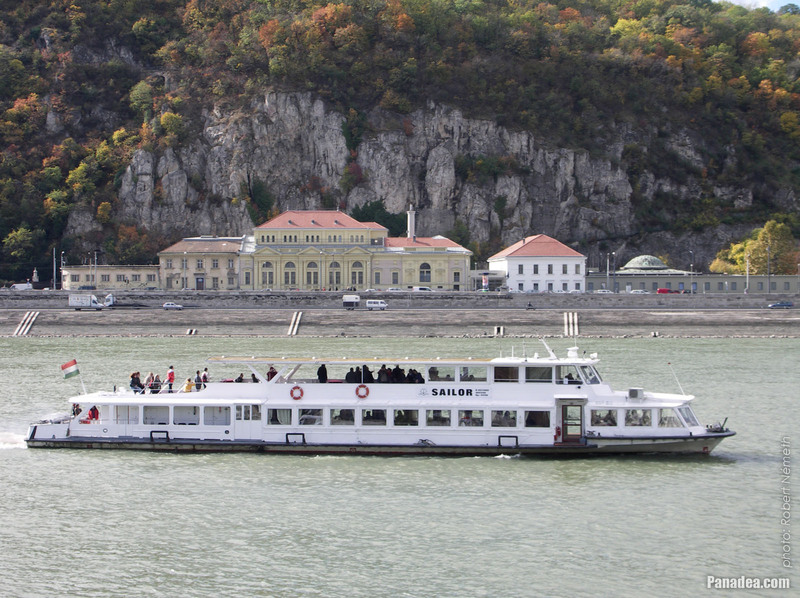 In the foreground it is the "Hableány" ("Mermaid") small pleasure boat on River Danube. 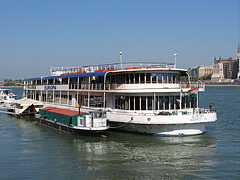 The powered passenger boat was constructed in Ukrain (then part of the Soviet Union) in 1949, and was brought to Hungary in 1992. 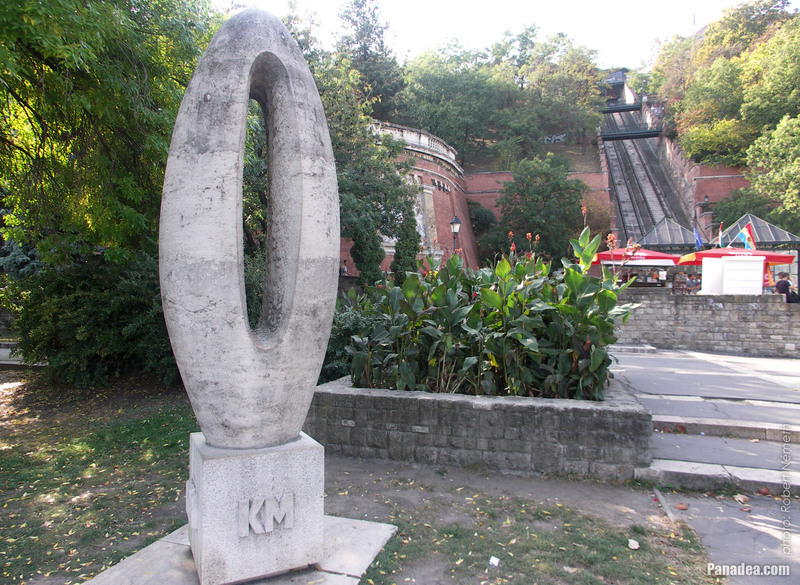 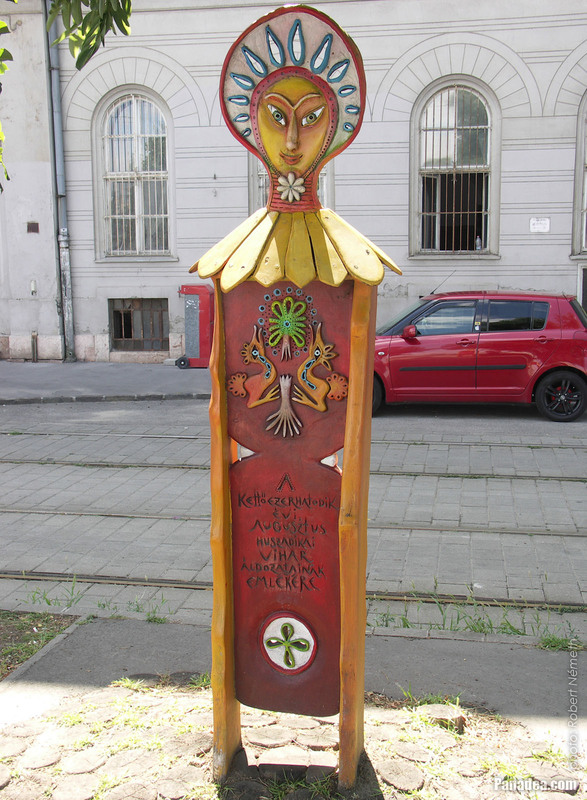 The stone sculpture symbolizes a number zero, and the kilometer numbering of the main roads of Hungary starts from this location. Sculpted by Miklós Borsos in 1975. 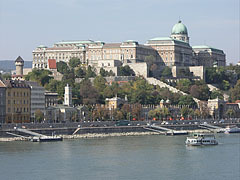 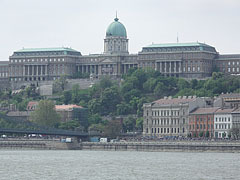 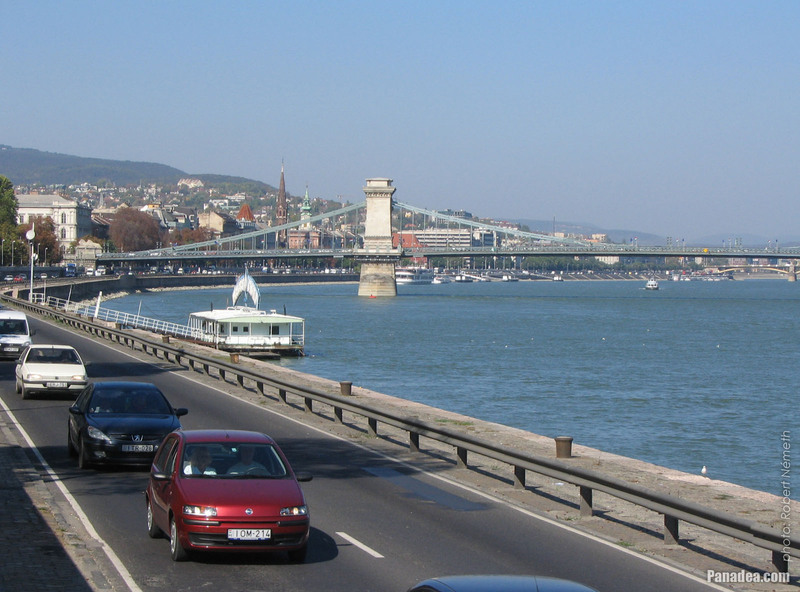 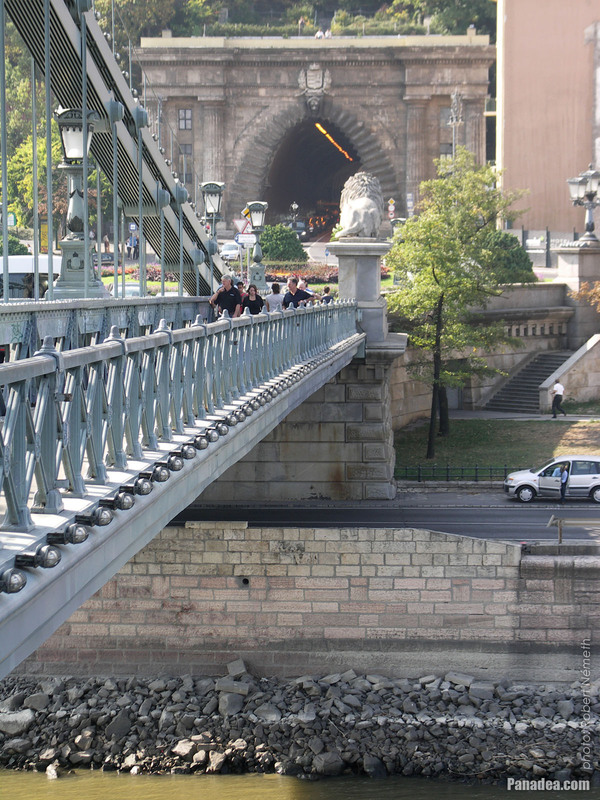 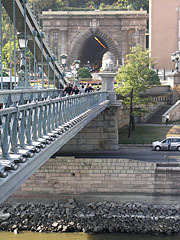 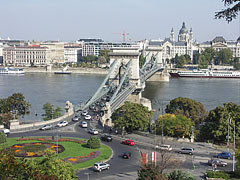 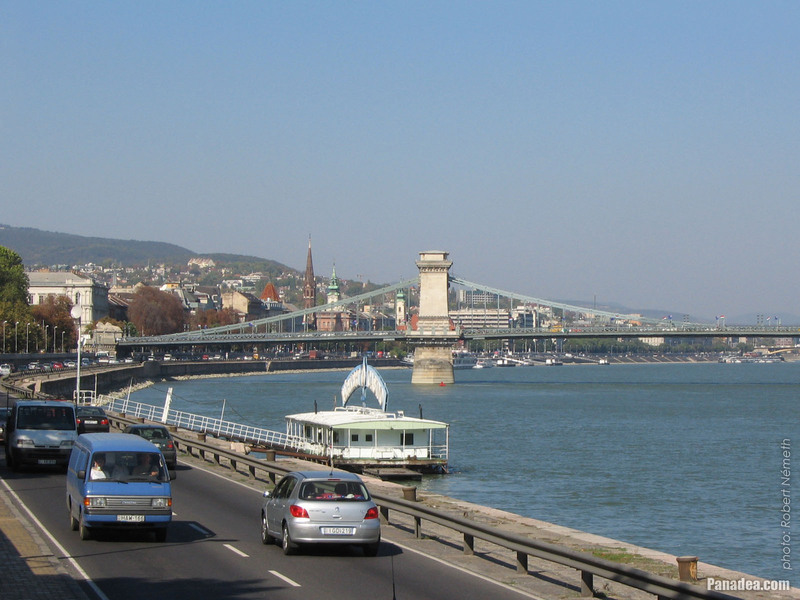 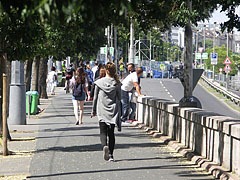 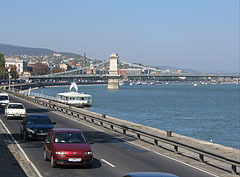 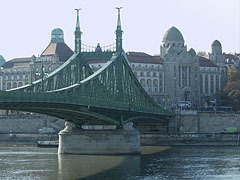 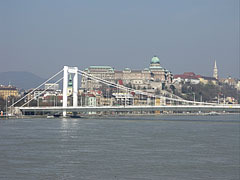 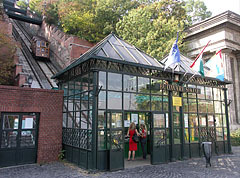 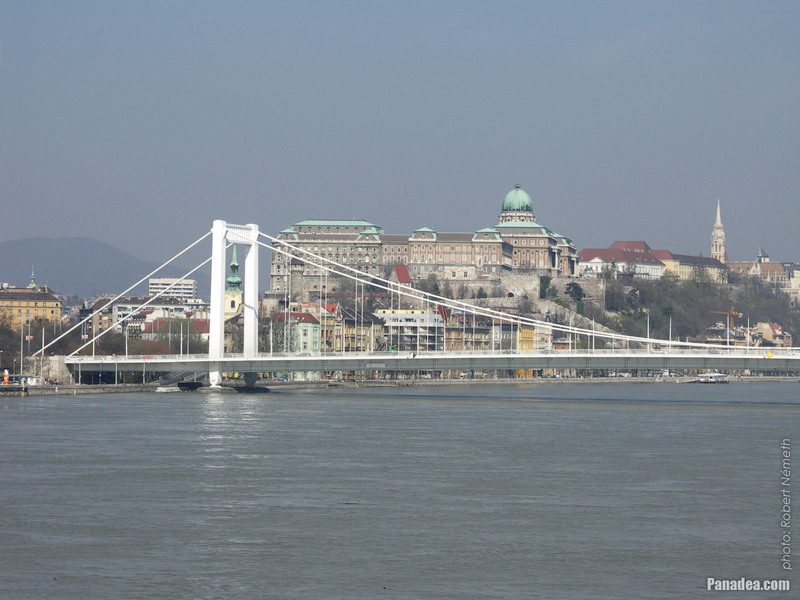 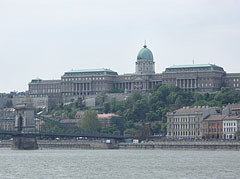 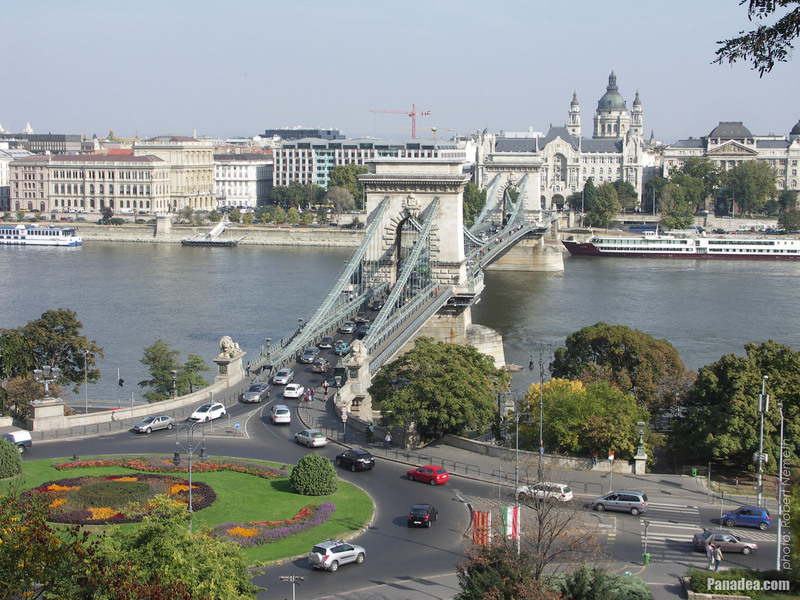 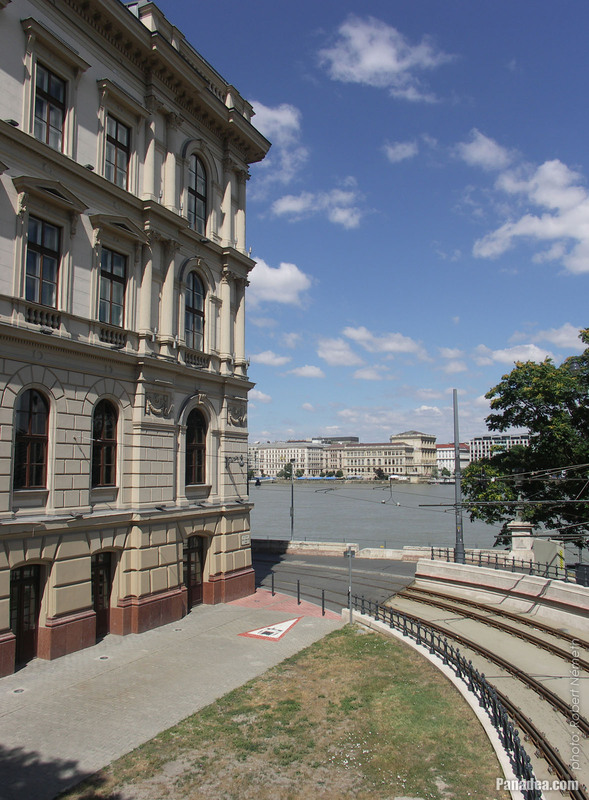 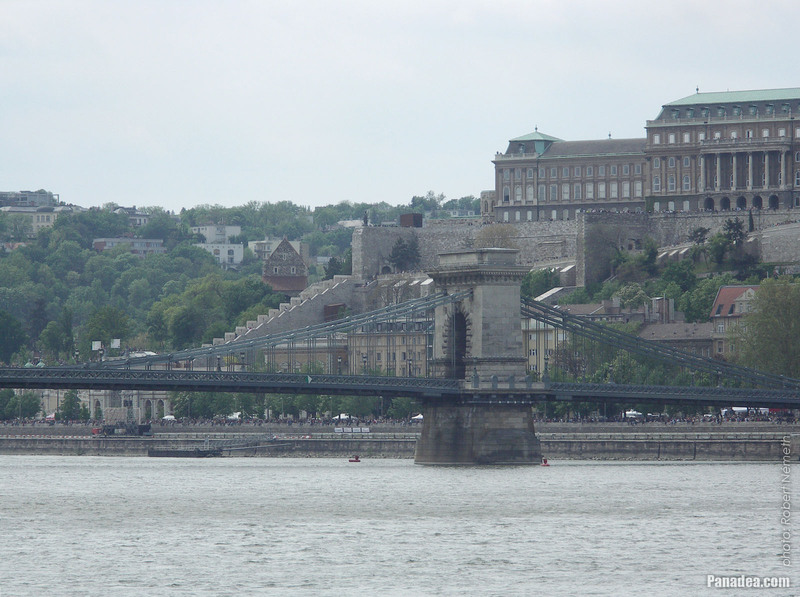 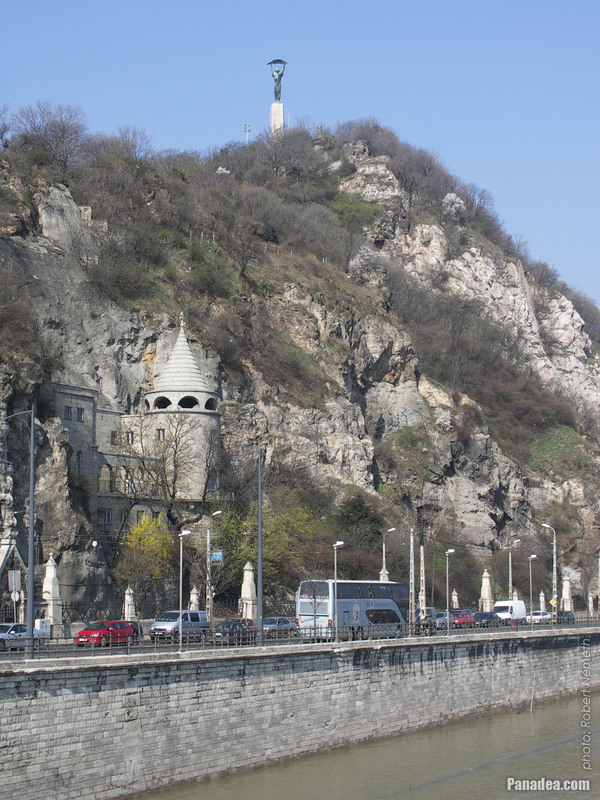 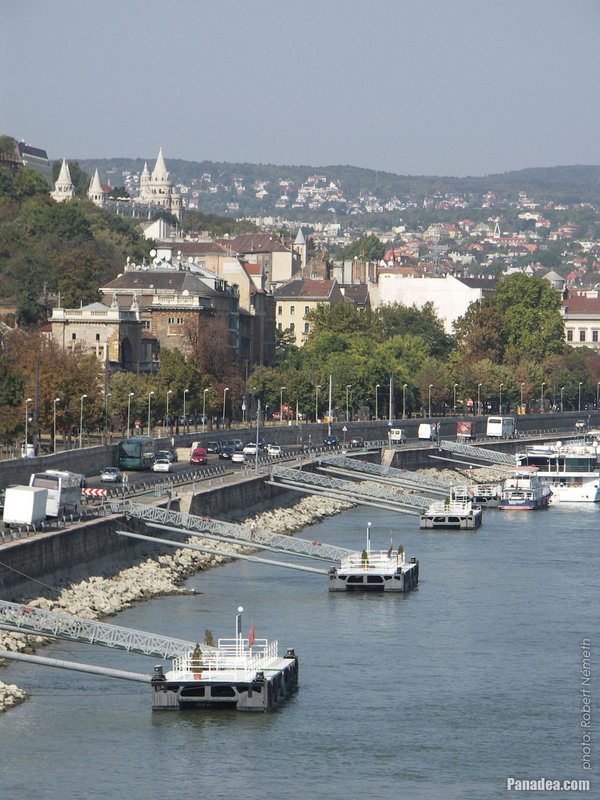 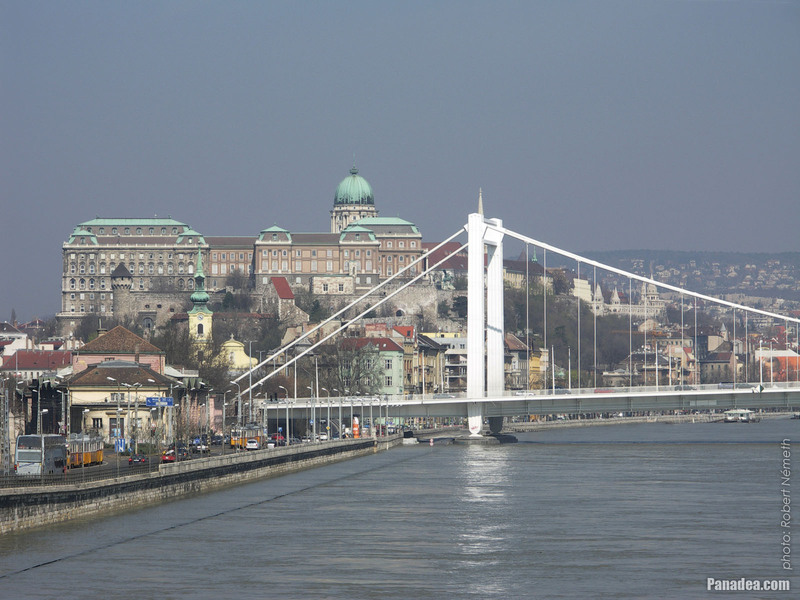 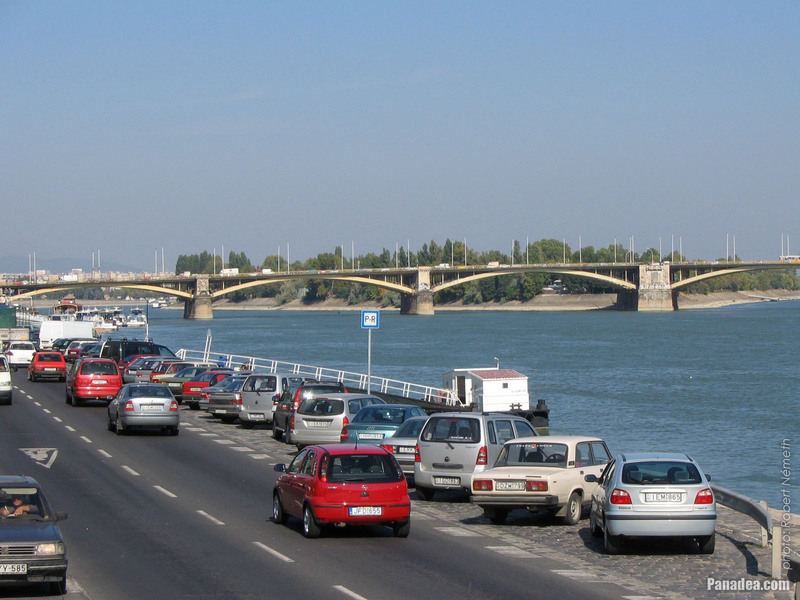 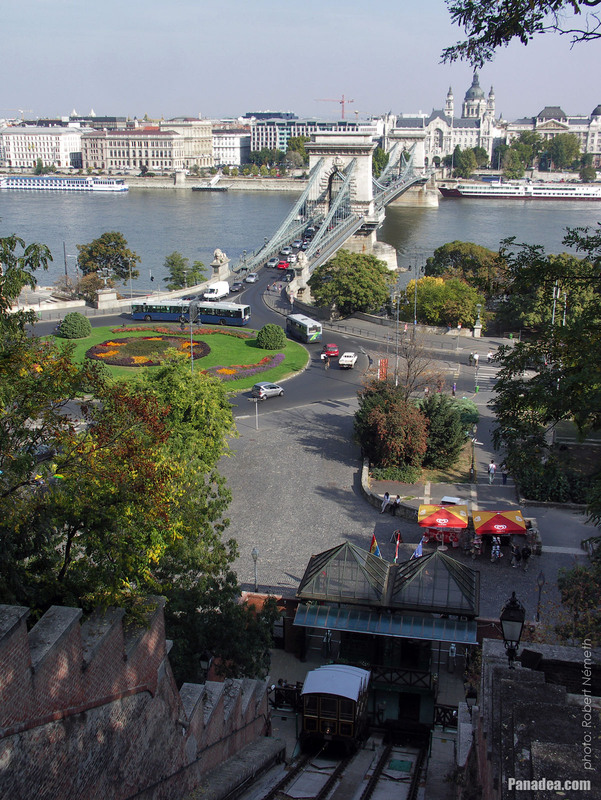 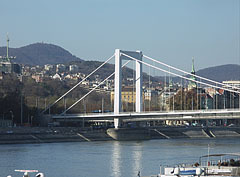 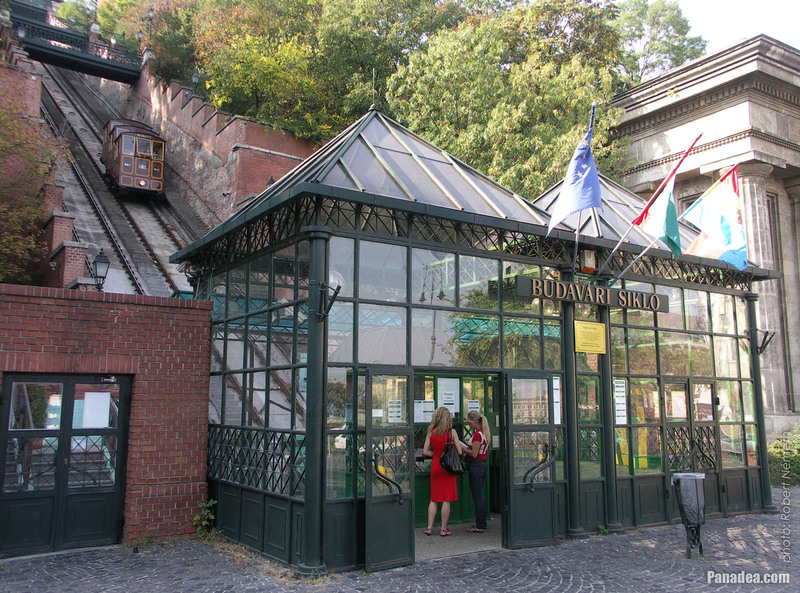 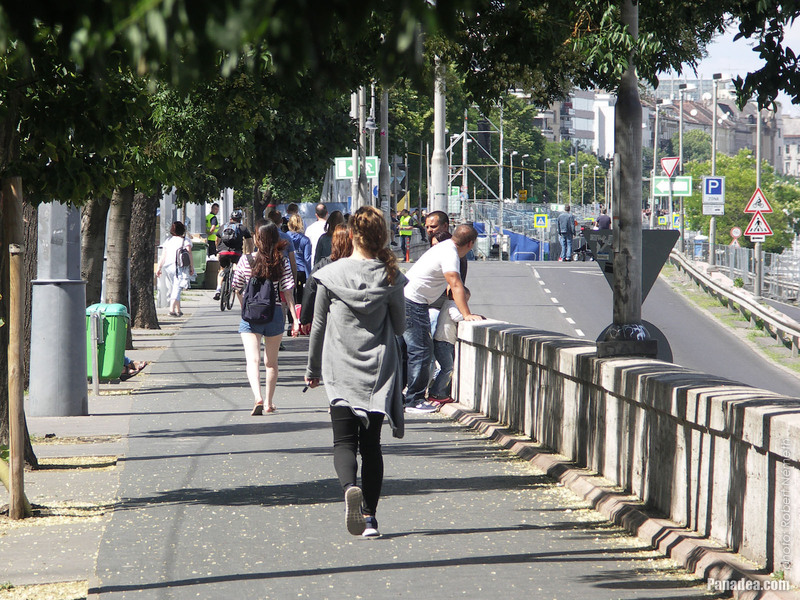 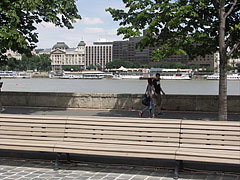 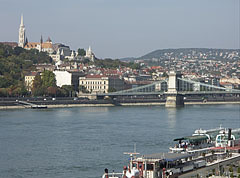 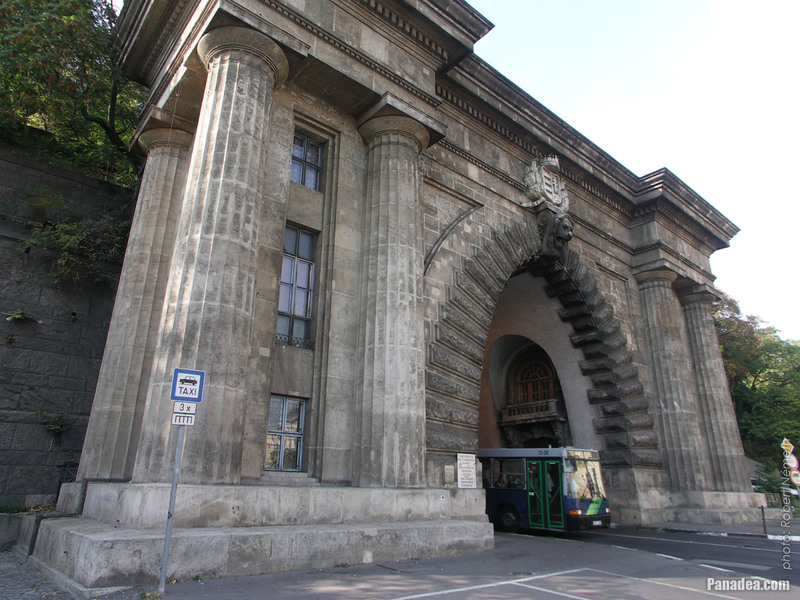 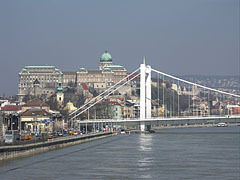 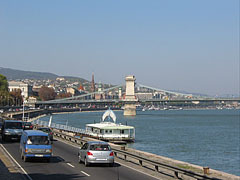 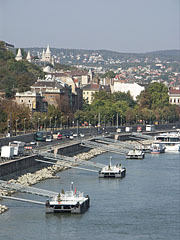 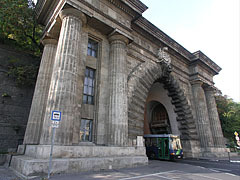 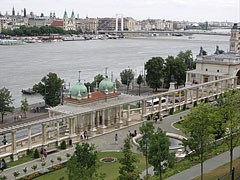 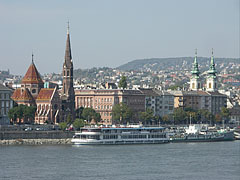 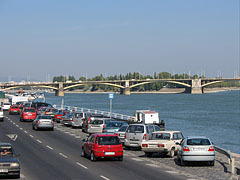 The 350-meter long two-lane road tunnel leads under the Buda Castle Hill, and it connects the Széchenyi Chain Bridge ("Lánchíd") on the Danube bank with "Krisztinaváros" quarter of Buda. 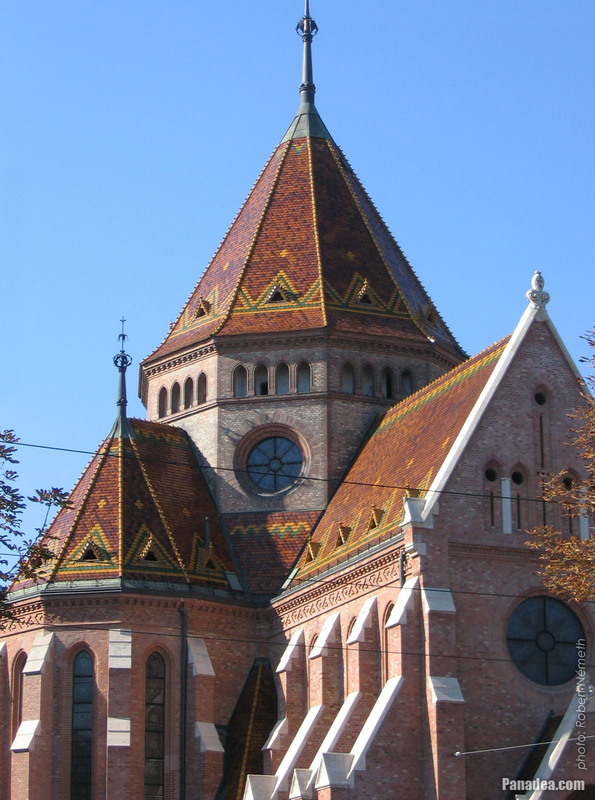 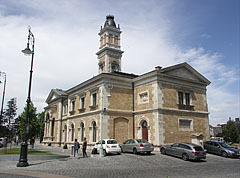 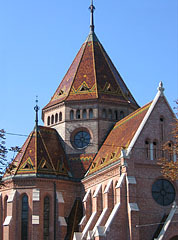 It was built between 1853-1857, designed by the Scottish architect Adam Clark. 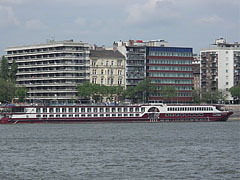 The "Serenity" hotel boat was built in the Netherlands in 2006, initially it was called "Hemingway" and was registered in Switzerland. 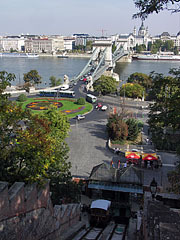 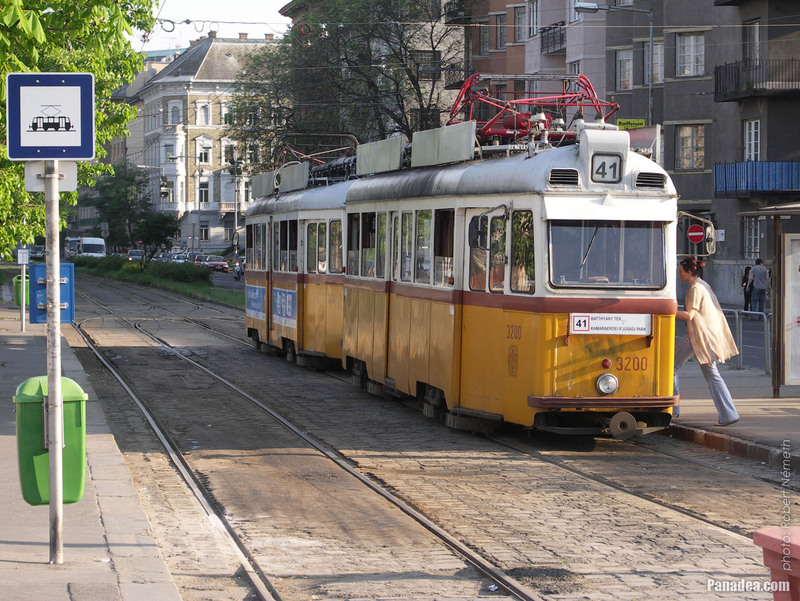 Since 2007 it is operating under the Dutch flag 2007 óta holland zászló alatt hajózik, előbb "Basilea Rhenus" nevre keresztelték, majd 2008-ban megkapta mai nevét. 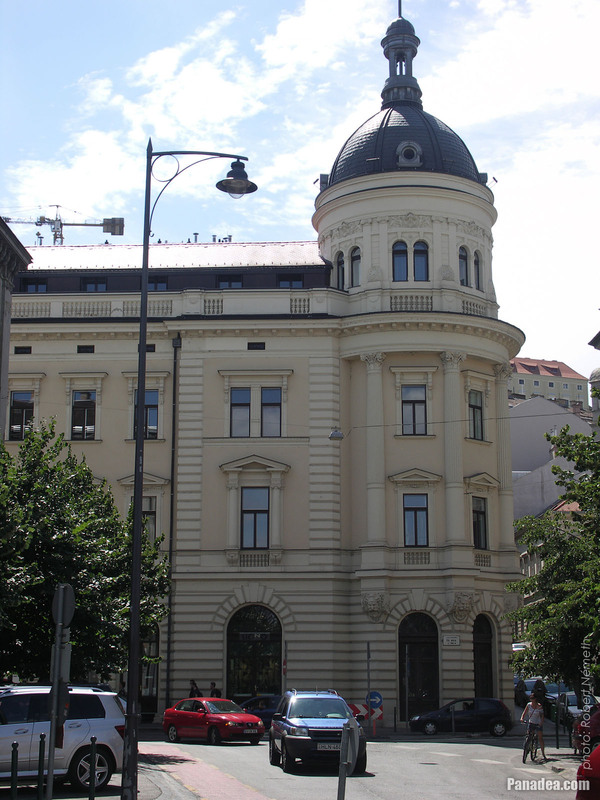 A folyami hajó 110 méter hosszú és kb. tizedannyi széles, az utaslétszáma pedig maximálisan 200 fő. 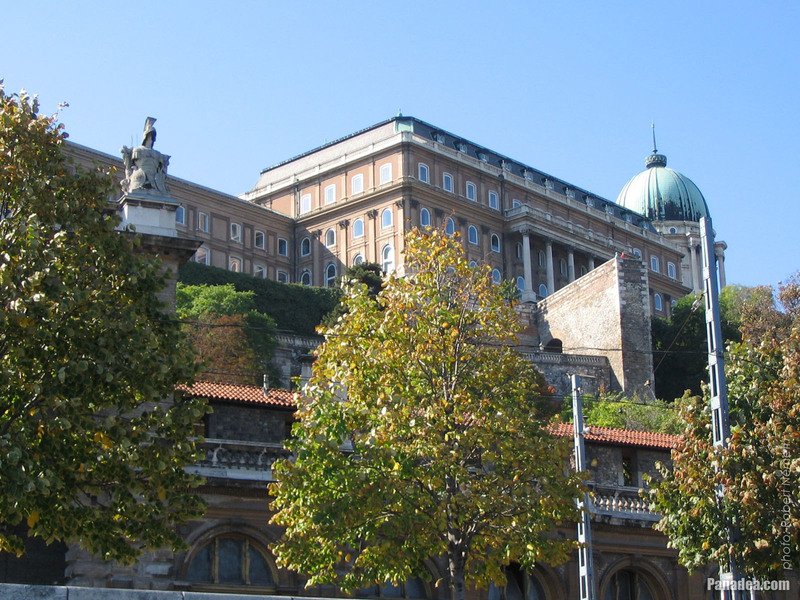 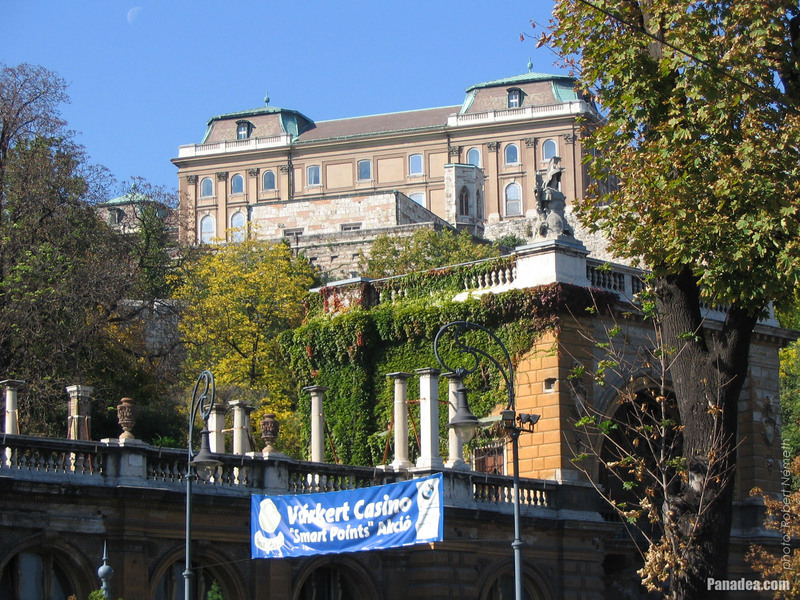 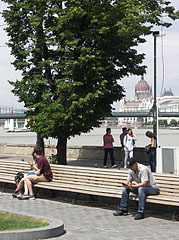 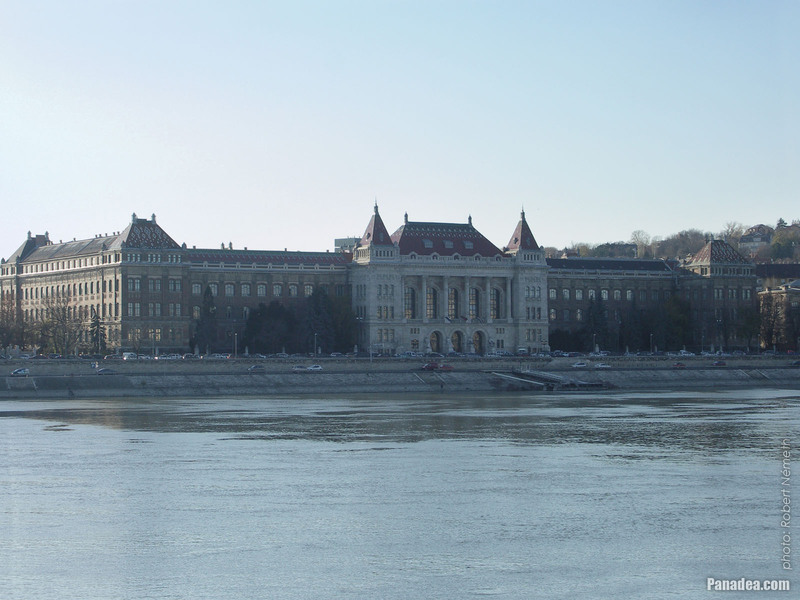 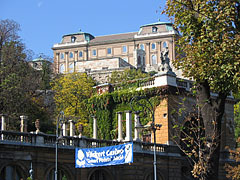 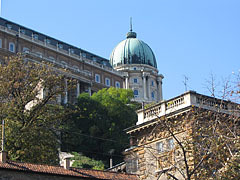 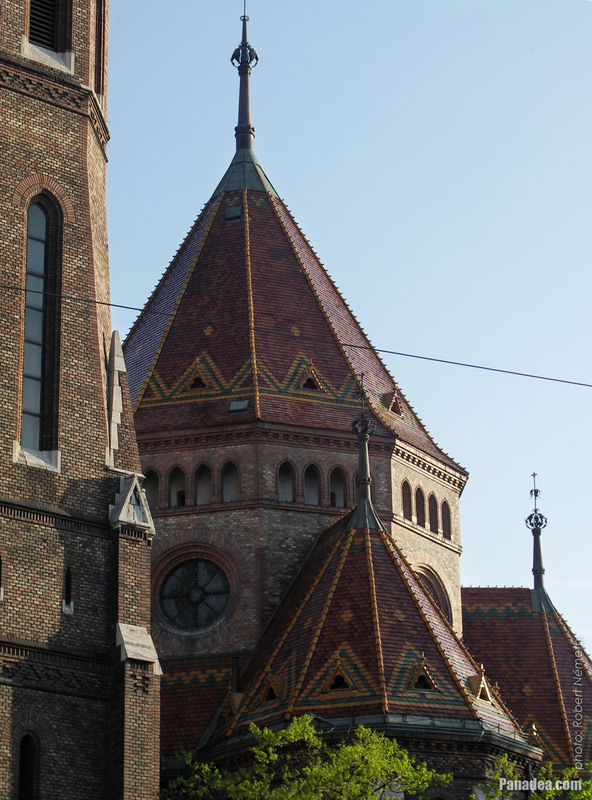 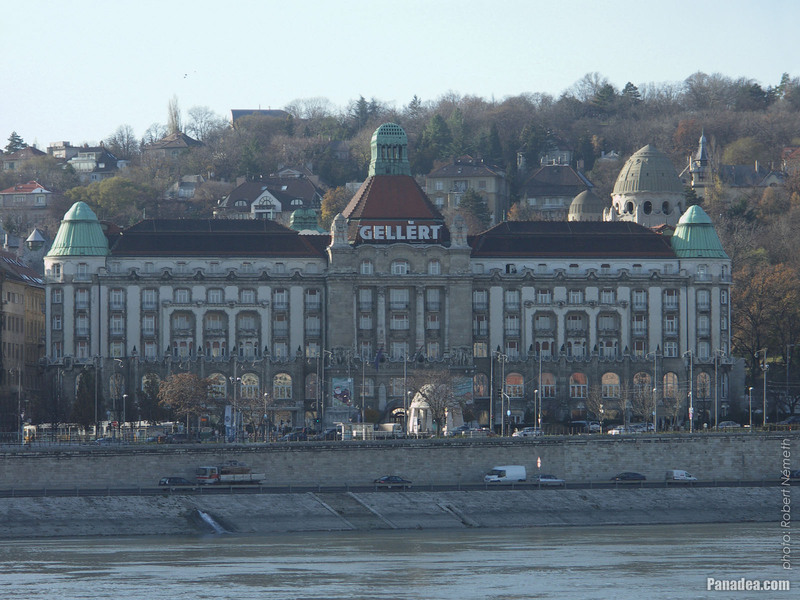 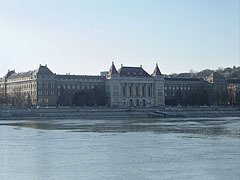 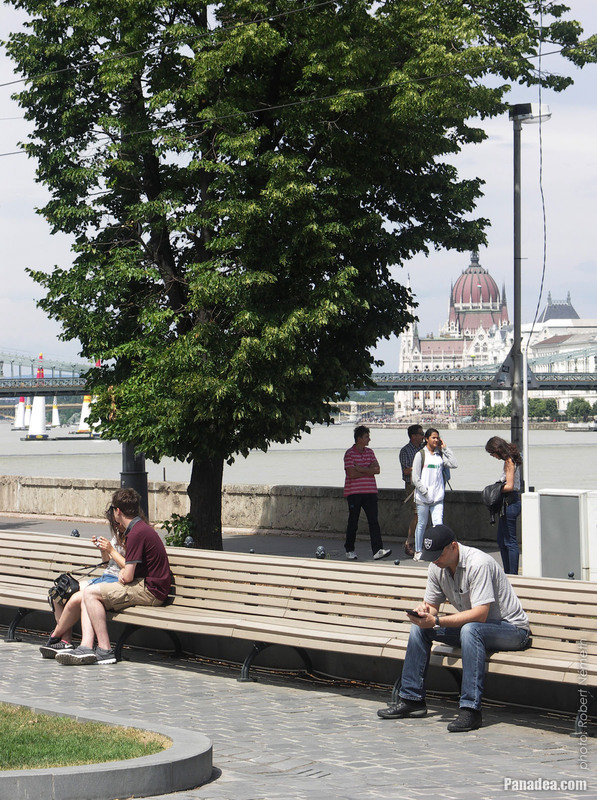 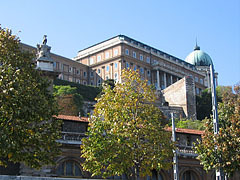 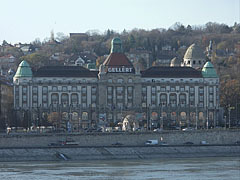 In the background among others it is a detail of the Buda Castle Palace. 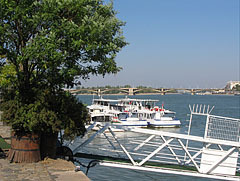 In the small harbor among others the "Szabadi", the "Millenium I" and the "Millenium II" pessenger boats are berthed (the former one was constructed in Hungary in 1964, and the others in the Soviet Union in 1990 and 1978). 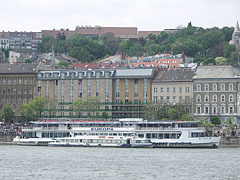 The German-owned 124-meter-long and 14-meter-wide river tourboat was built in Germany in 2002, and it has a capacity of 242 persons. 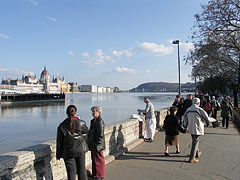 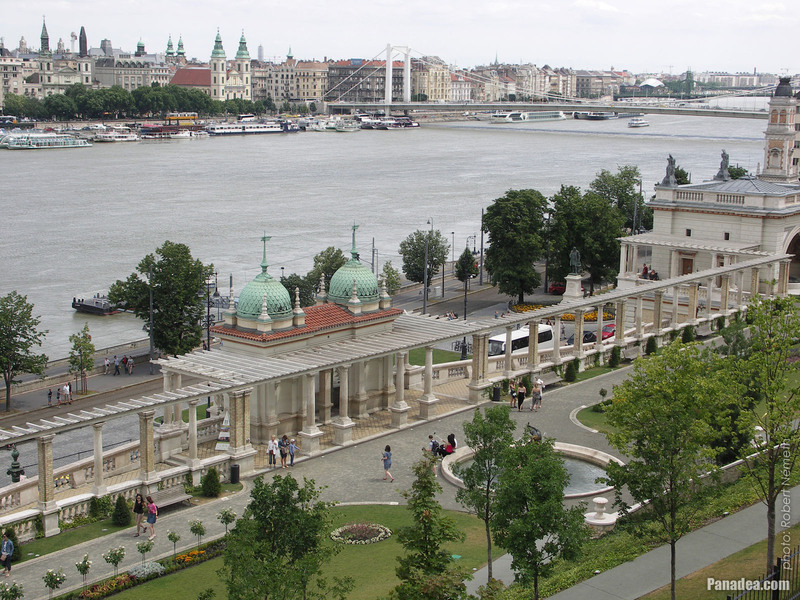 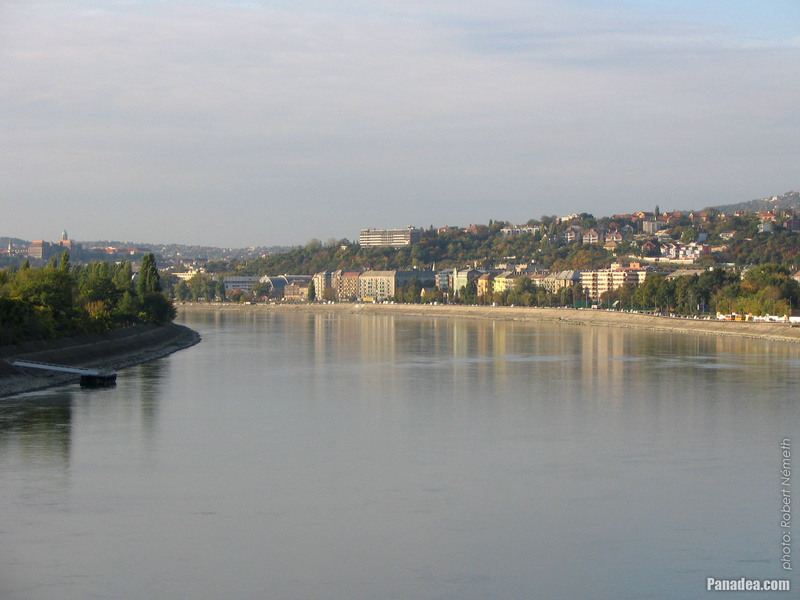 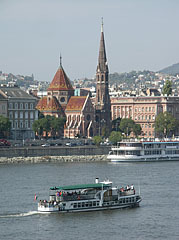 The 78-meter-long powered riverboat was constructed in Óbuda (Budapest, Hungary) in 1959. 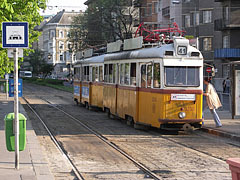 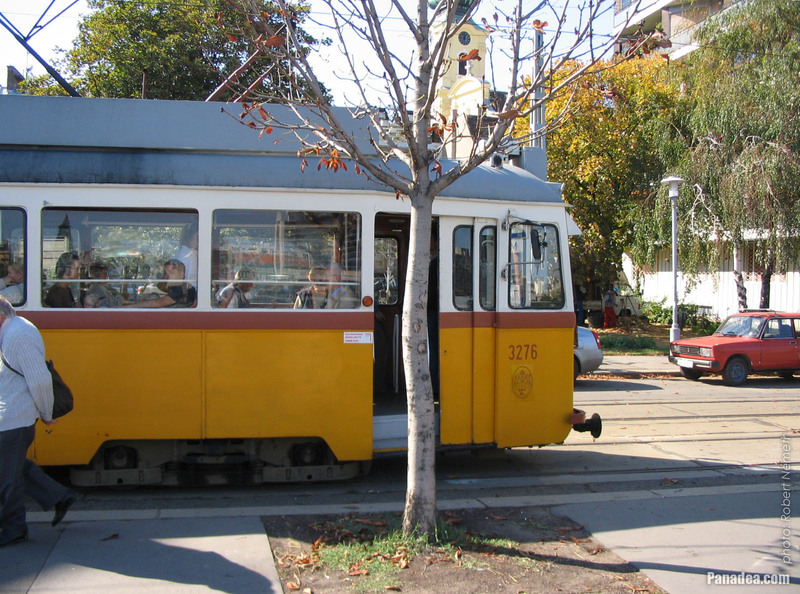 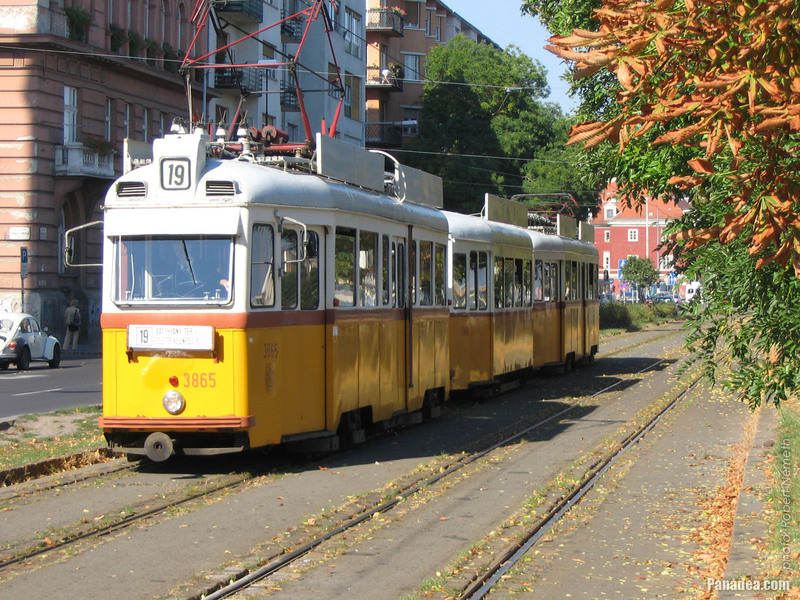 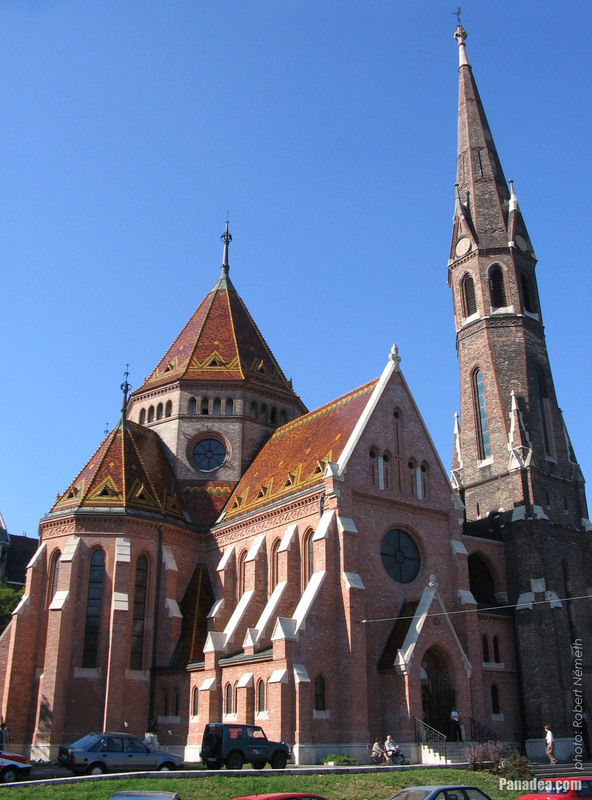 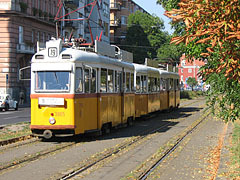 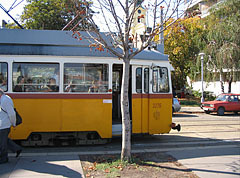 Until 2000 it was operated in Rostov, Russia under Soviet and then Russian flags, and then it was moved to Hungary. 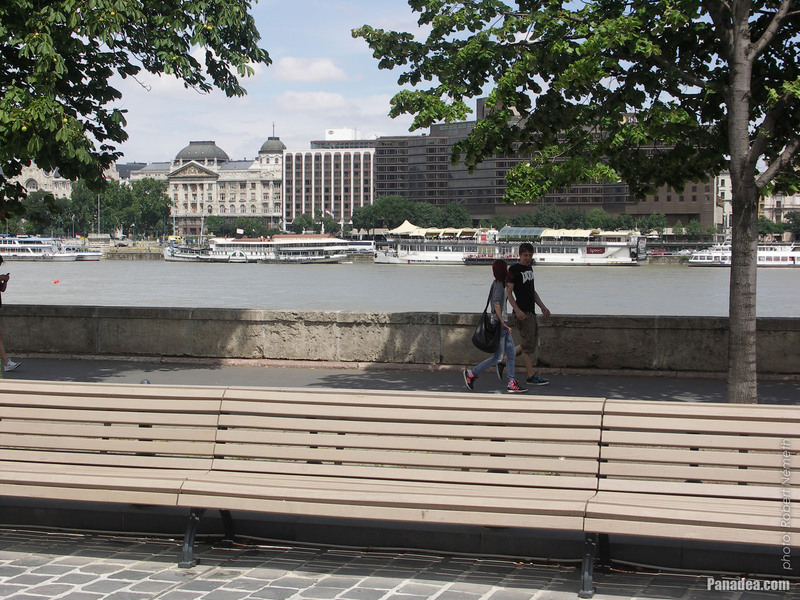 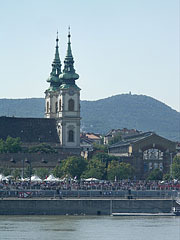 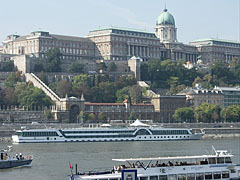 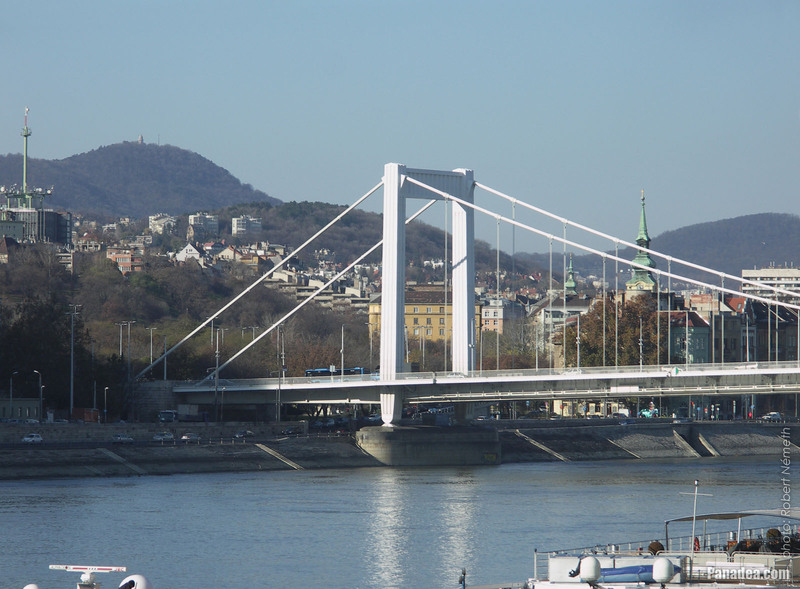 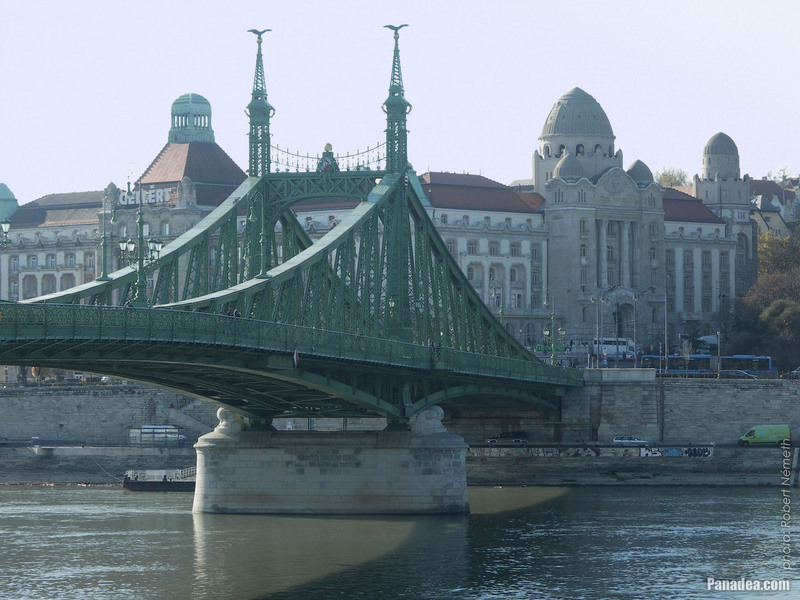 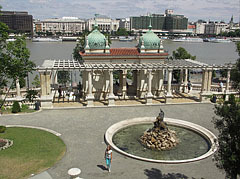 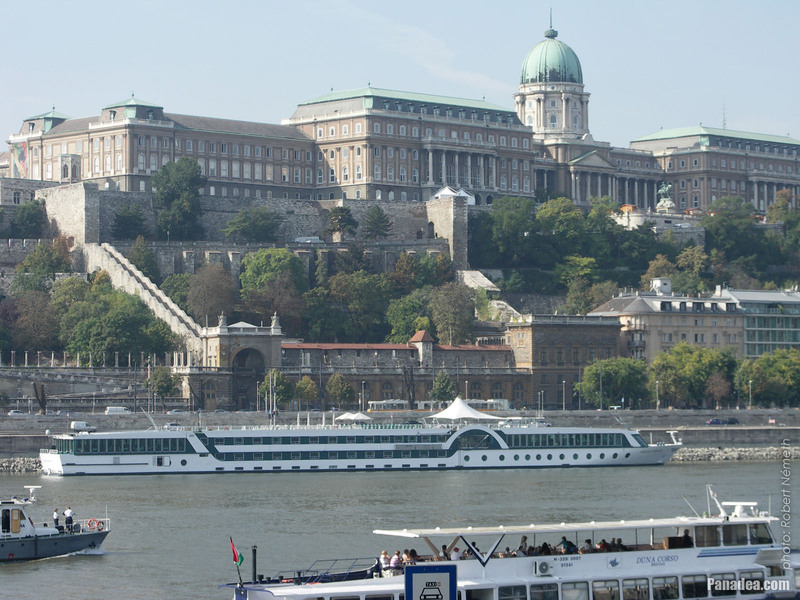 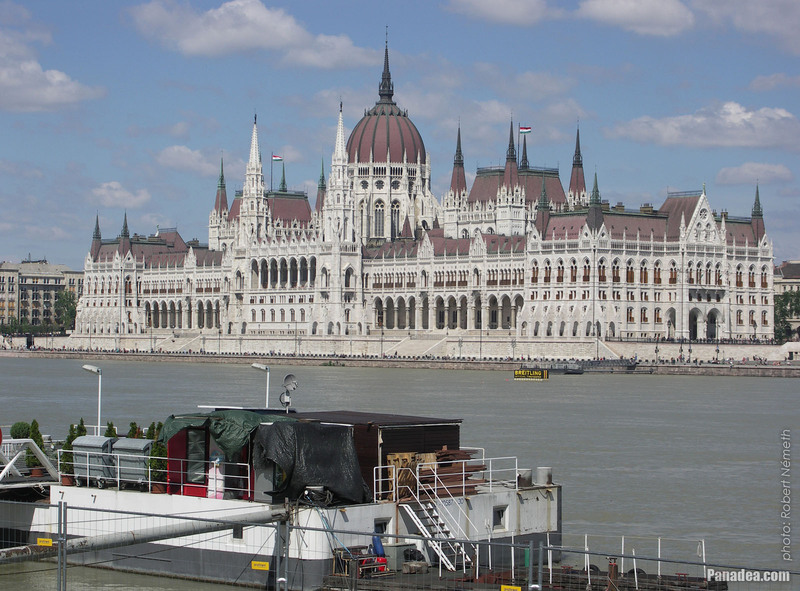 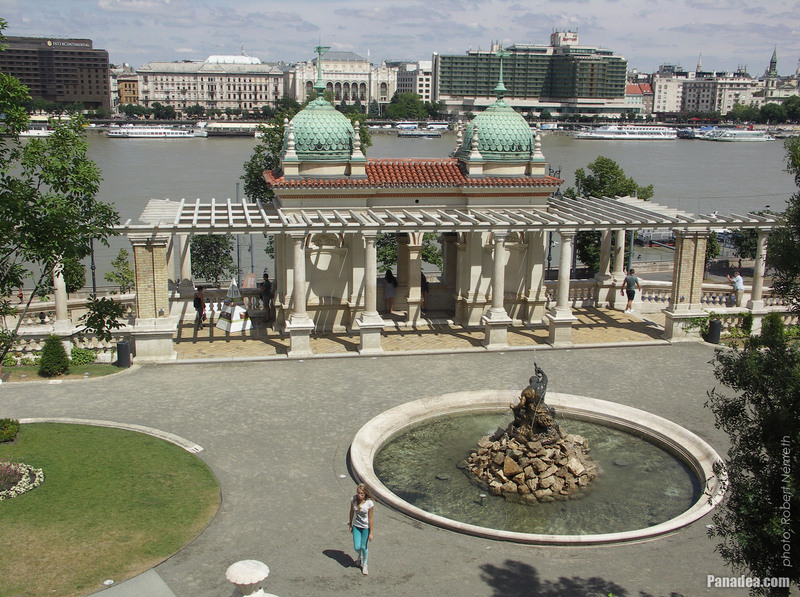 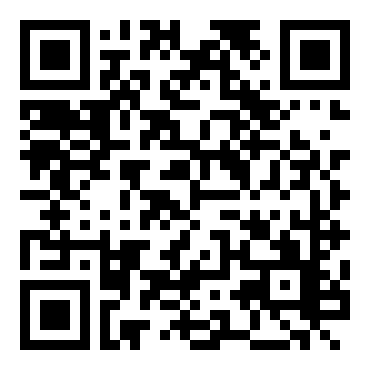 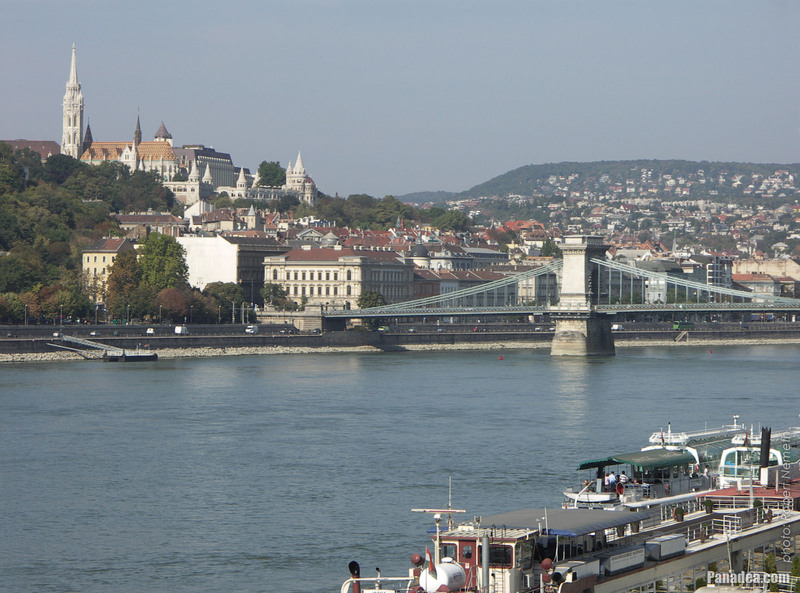 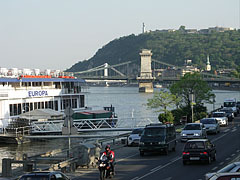 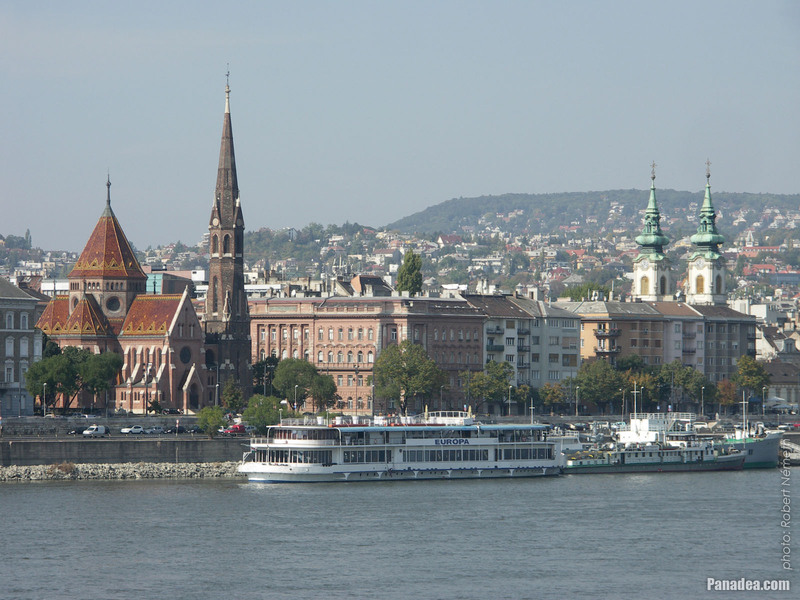 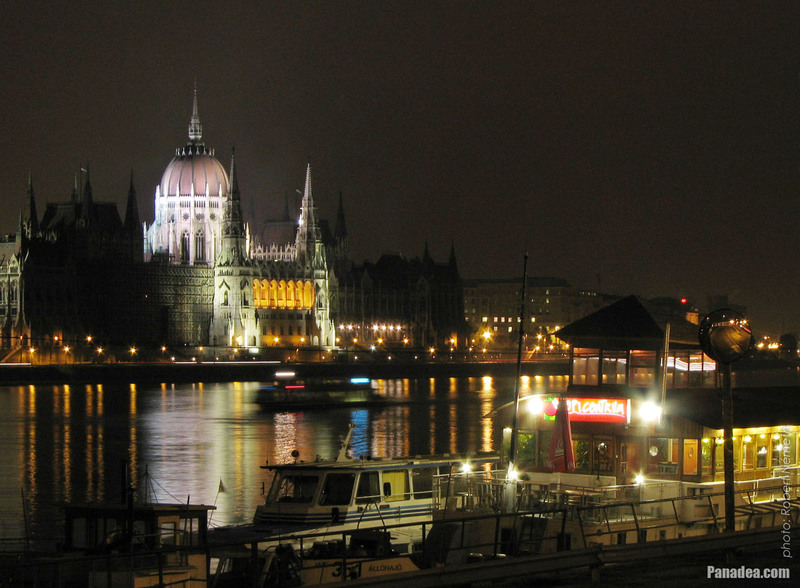 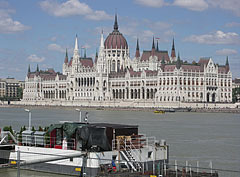 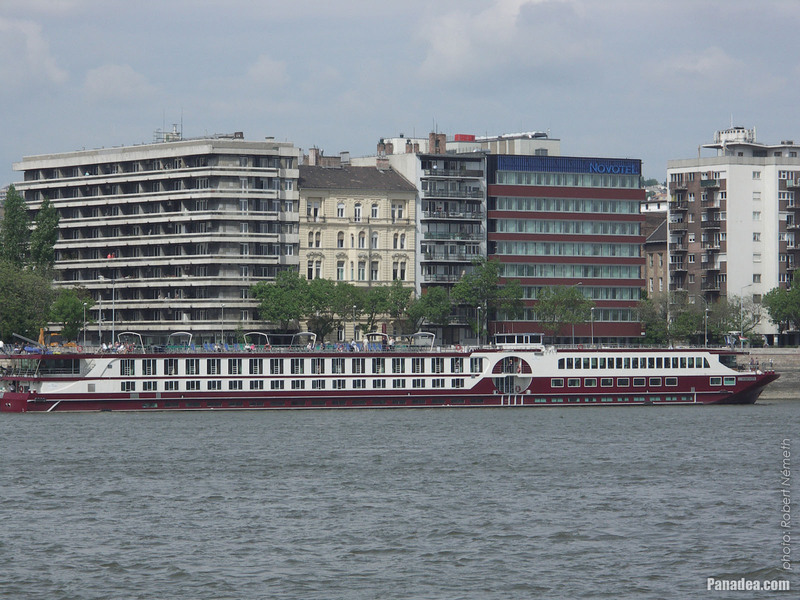 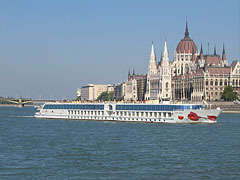 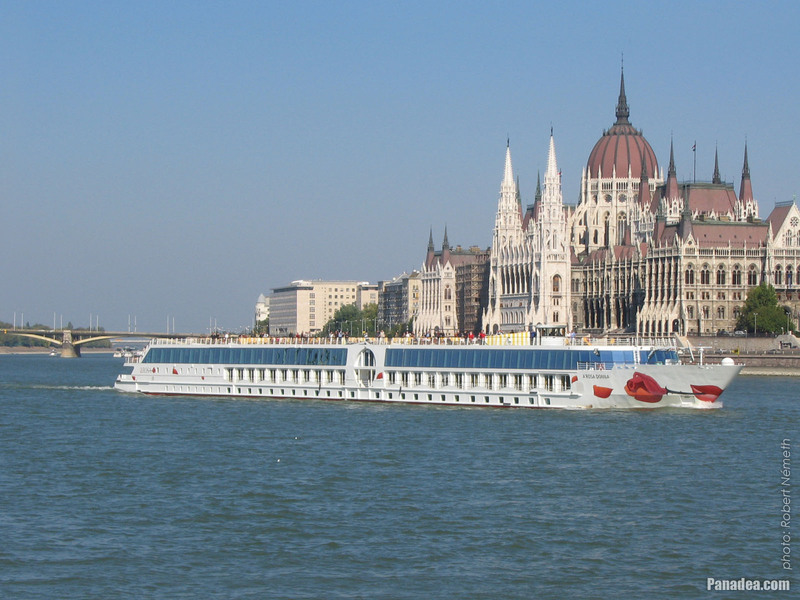 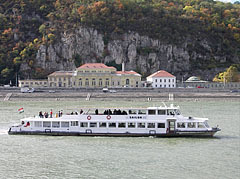 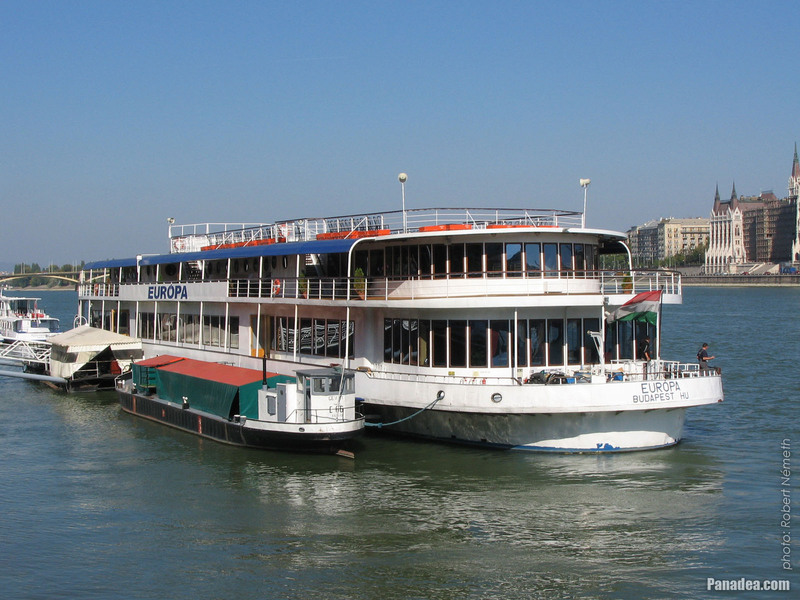 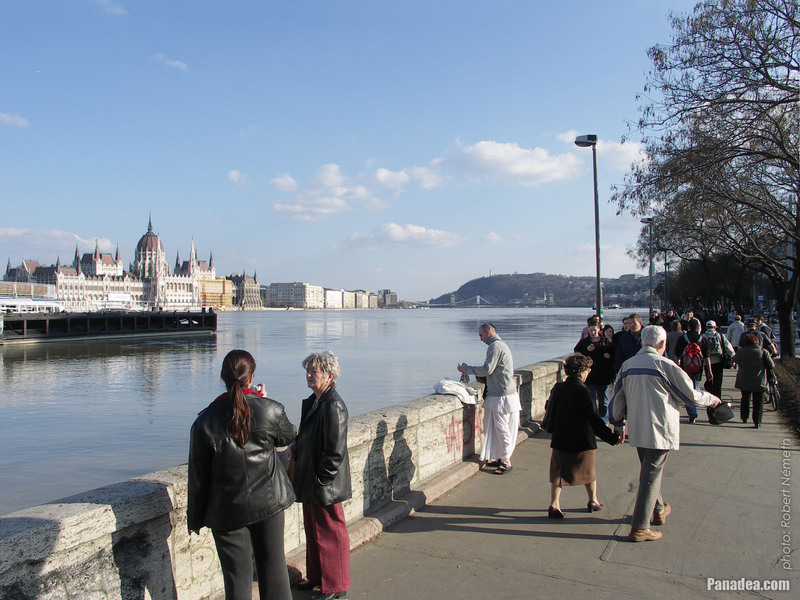 In 2001 it was completely rebuilt and it became an event boat on the Danube in Budapest. 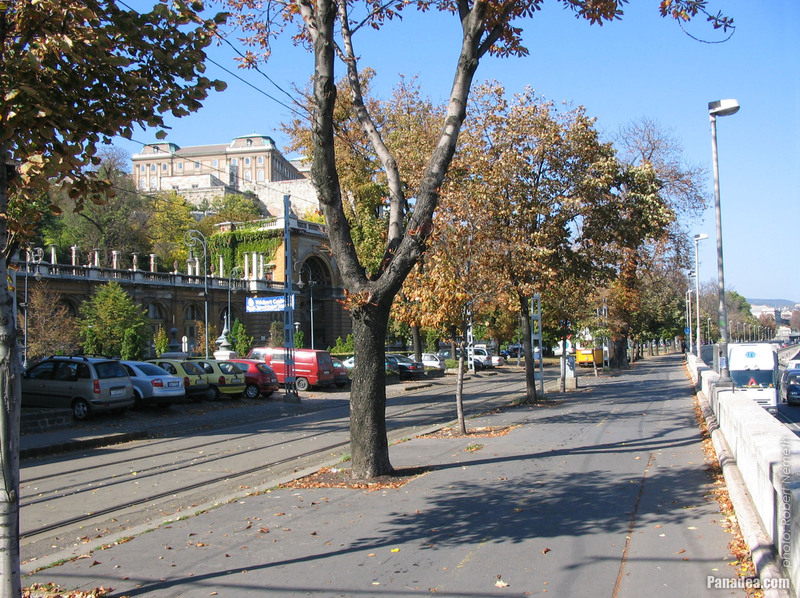 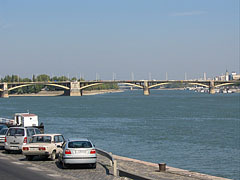 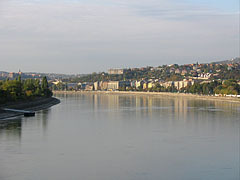 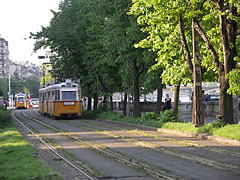 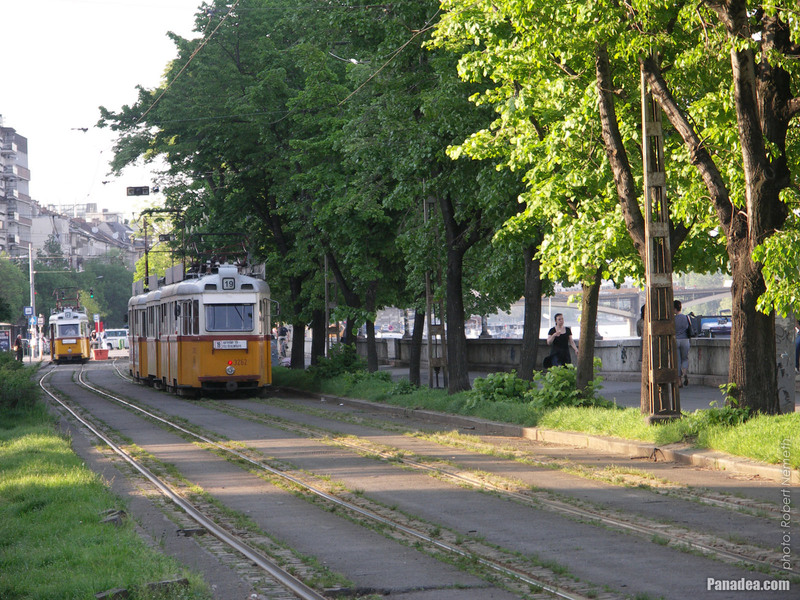 On the left the Margaret Island ("Margit-sziget") can be seen. 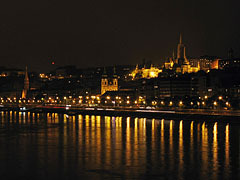 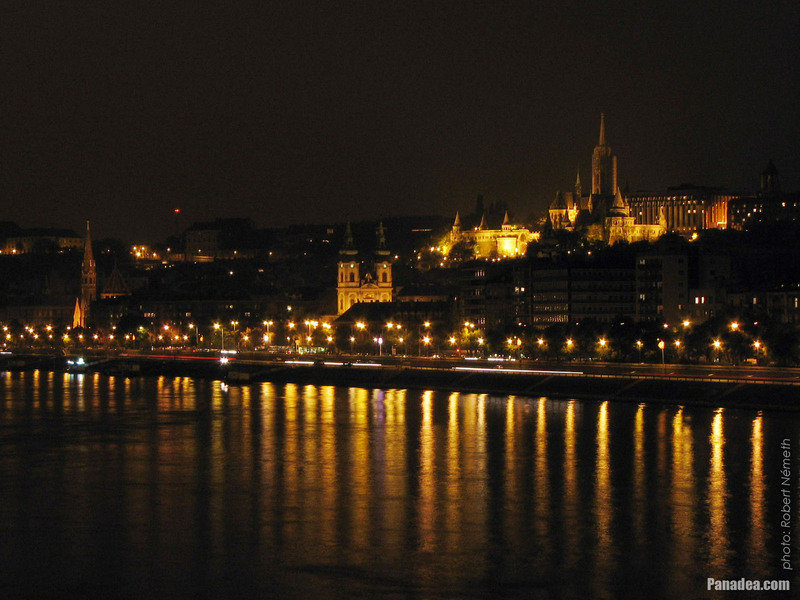 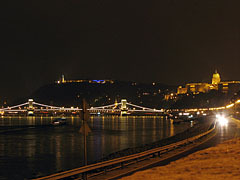 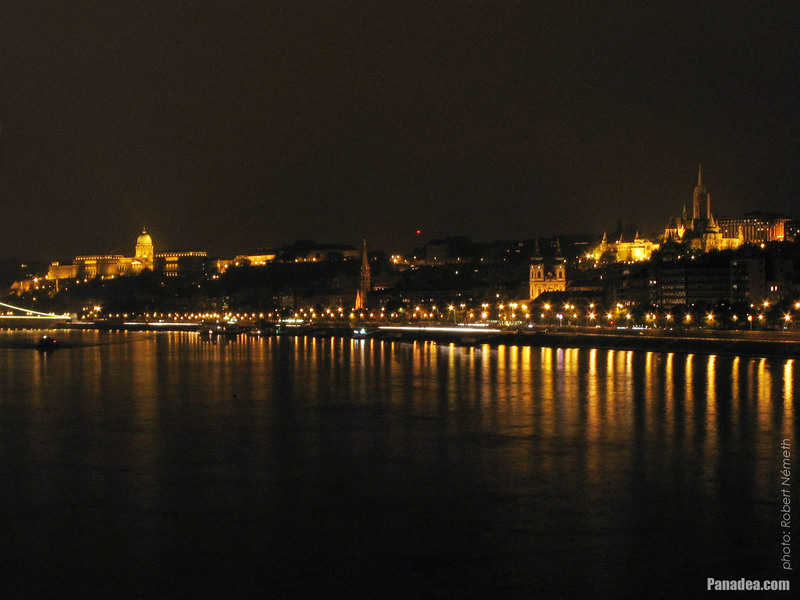 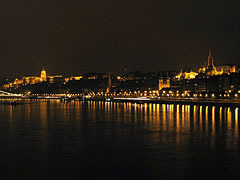 The panorama of the Danube bank at night, as seen from the Buda-side embankment: Chain Bridge, Gellért Hill, Buda Castle, etc. 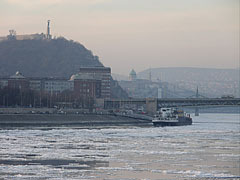 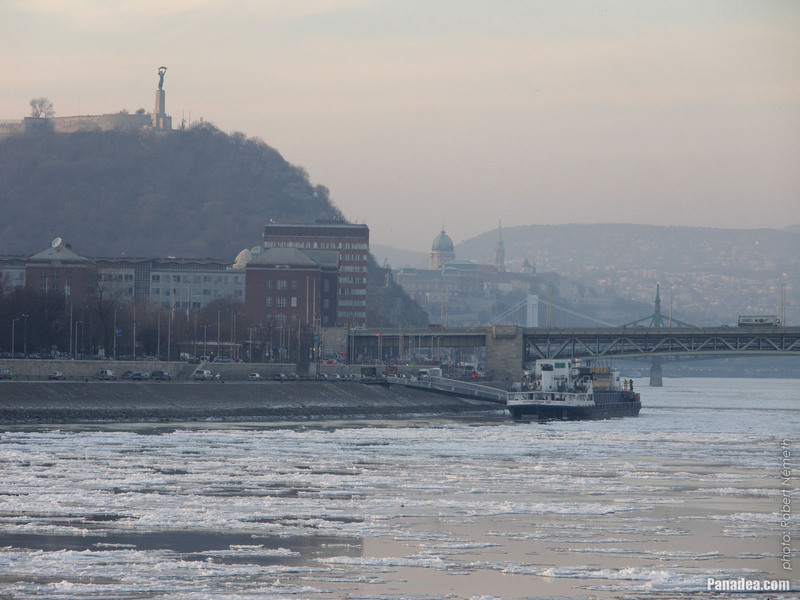 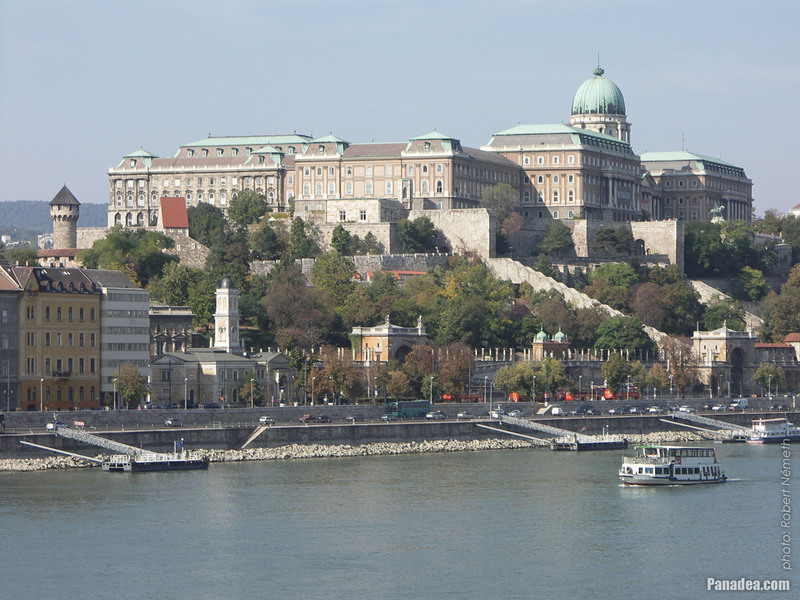 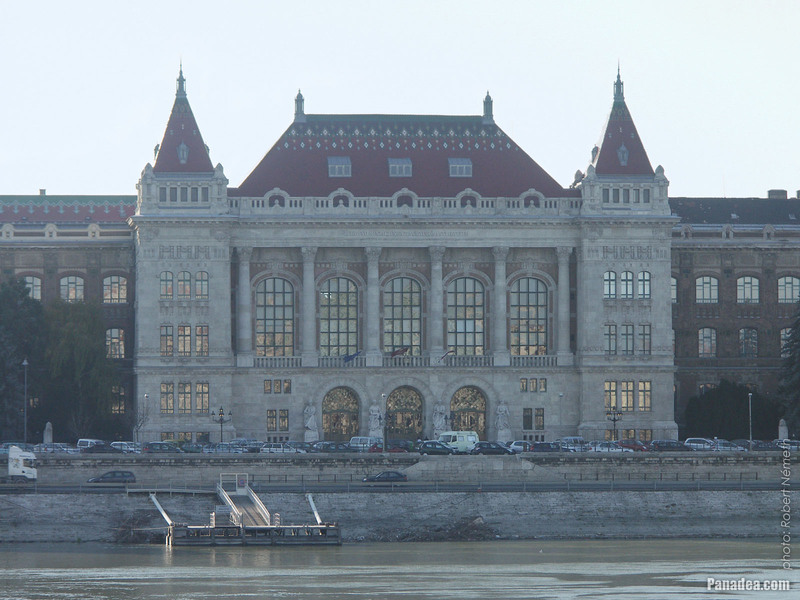 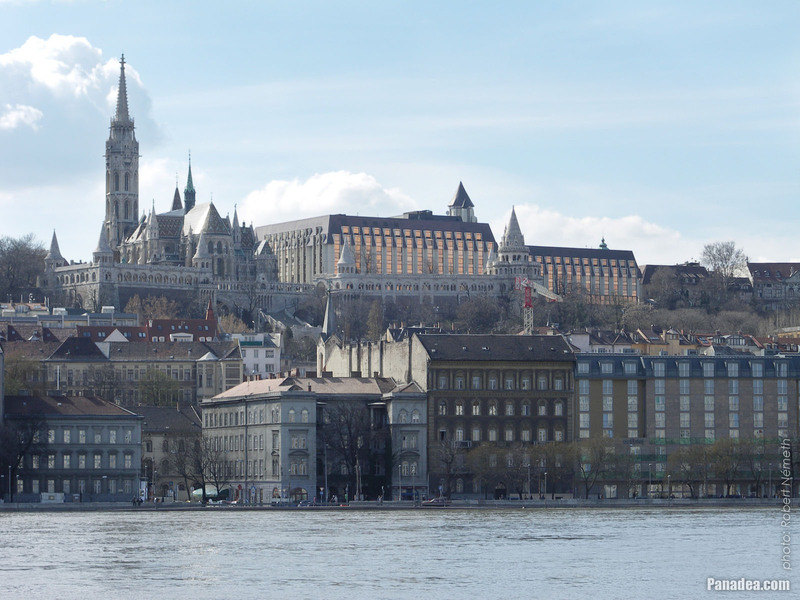 Despite the misty winter weather the Gellért Hill and the Buda Castle also can be seen. 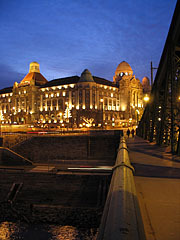 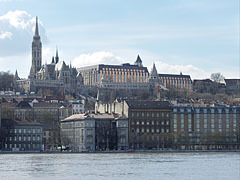 Beside the Fisherman's Bastion ("Halászbástya") the modern building is the five-star Hotel Hilton Budapest. 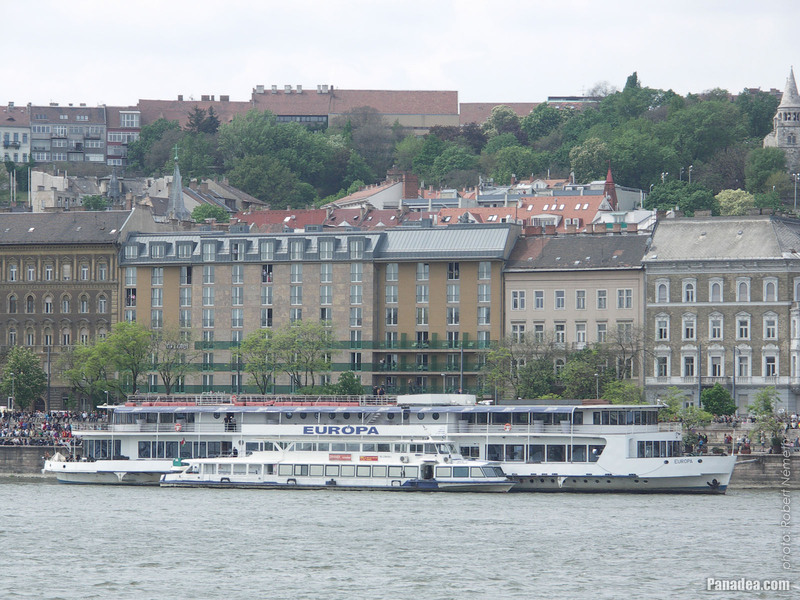 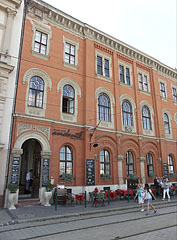 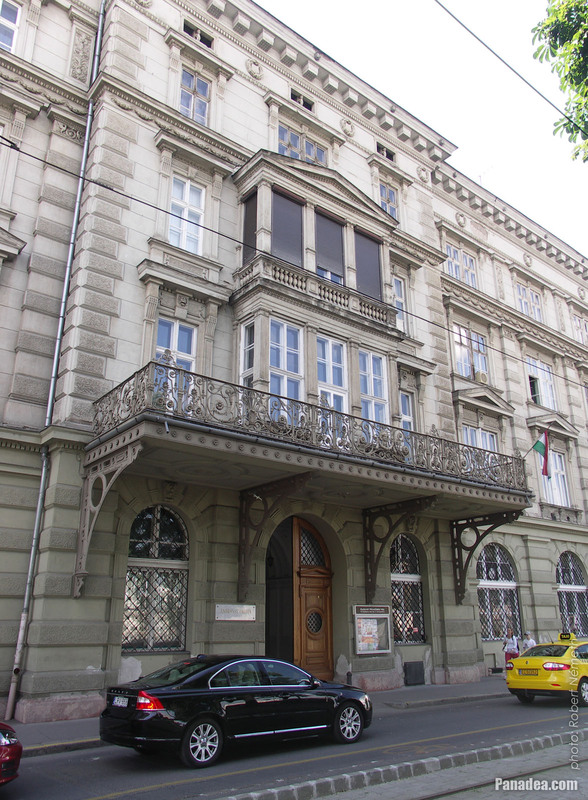 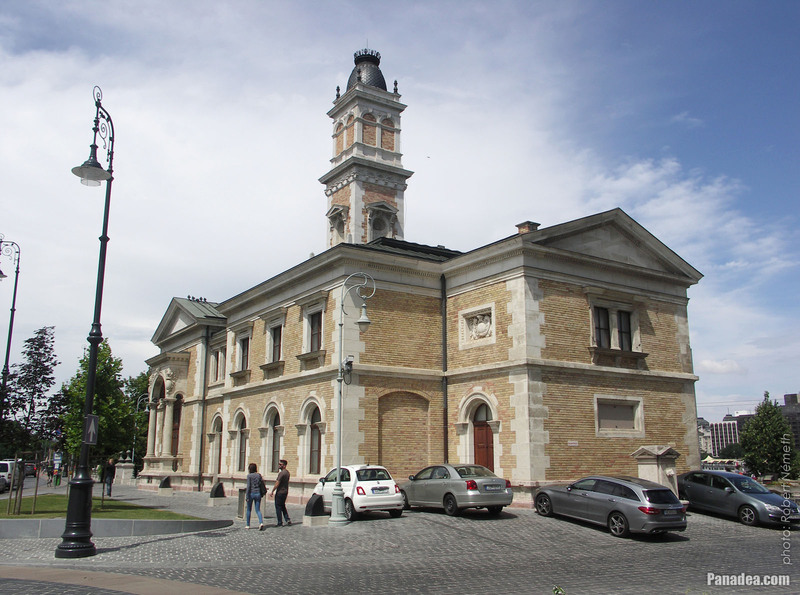 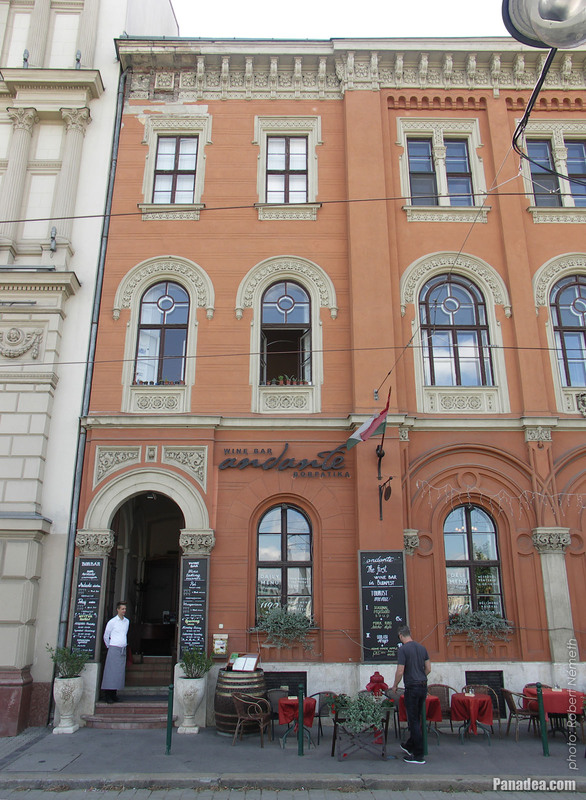 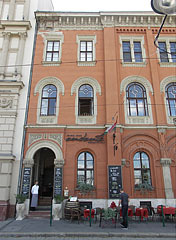 This was the first Hilton hotel in Eastern Europe. 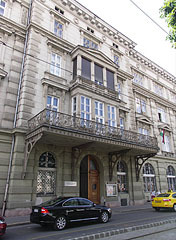 It was opened in 1976, designed by Béla Pintér and János Sedlmayer (the latter architect designed the monumental part of the building).